Over the final weekend in April, Geoffrey and I went on an urban adventure to the Cherry Blossom Festival (aka Sakura Matsuri) at the Brooklyn Botanic Garden, and we had all kinds of crazy fun being outdoors in the beautiful nature, and taking many, many (read: too many) photos of the gorgeous flowering trees and other flowers and plants. Super fun! 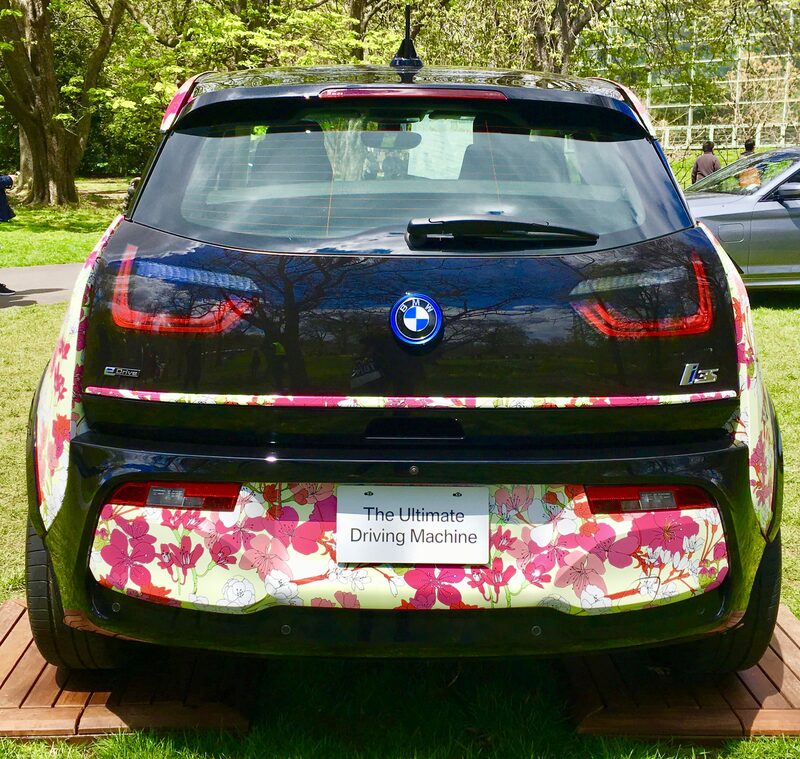 As a tie-in with the festival, event sponsor BMW (The Ultimate Driving Machine, as it is known) created a Sakura-themed car with a custom paint job covering the car in a cheery cherry blossoms design! Spectacular! Here is a detail of the finish, up close. 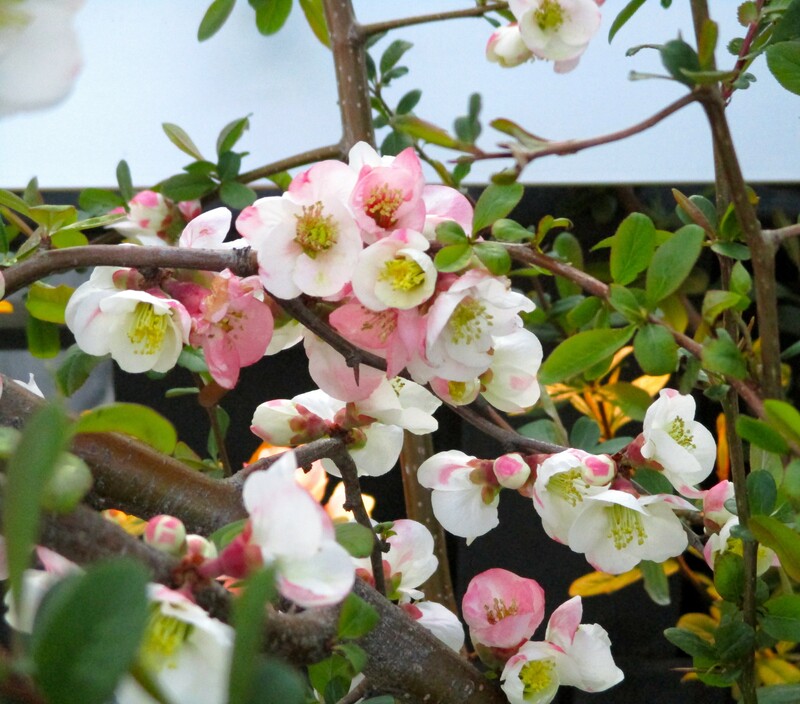 If you have been around an assortment of cherry blossoms before you will observe that they have many different blossoms represented, just like they did at the Garden! 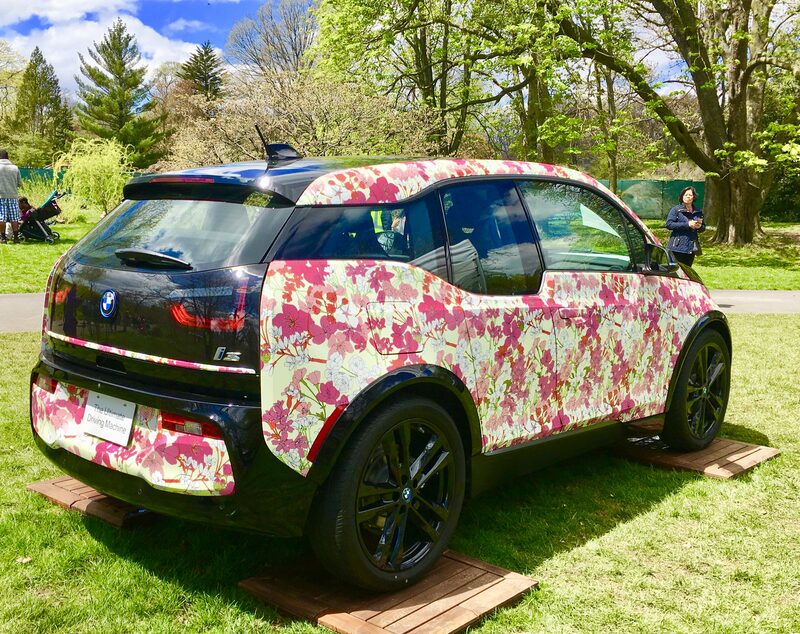 I didn’t think to look inside the car to check out the interior, since the ground was a bit damp from rain the previous evening and I was trying to stay off the wet grass as much as possible. 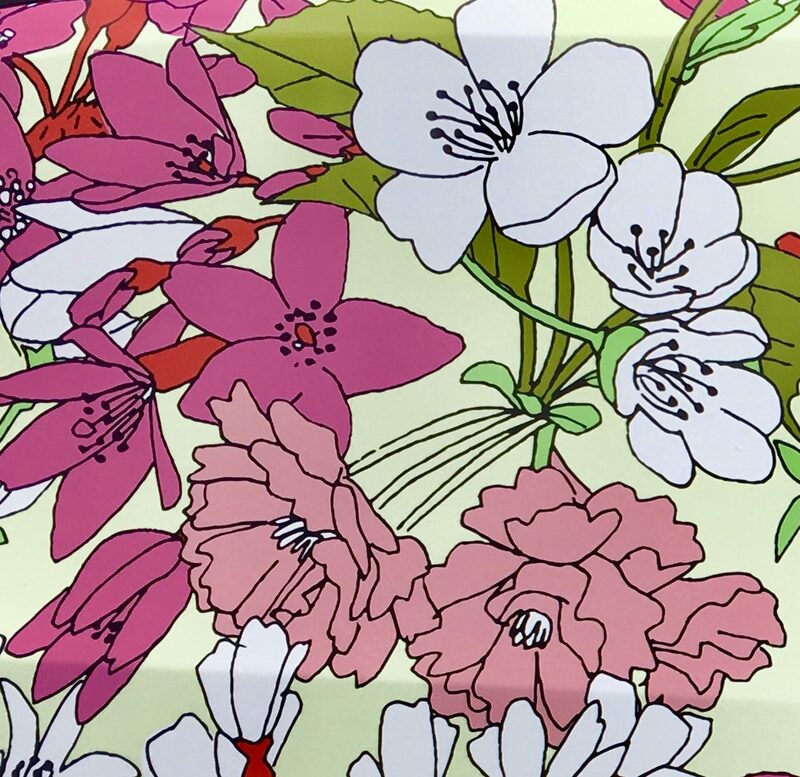 Point being that I can’t say whether the floral design carried over to the car’s dashboard and upholstery. 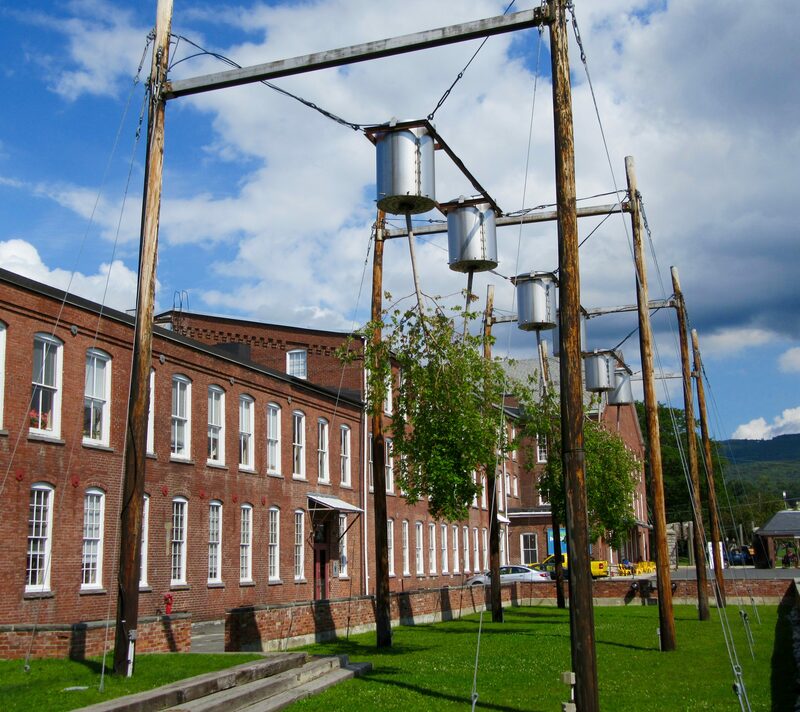 “Hey, look at those upside down trees!” I shouted to my friends as we approached the entrance to Mass MoCA, the coolest contemporary art museum in the Universe. 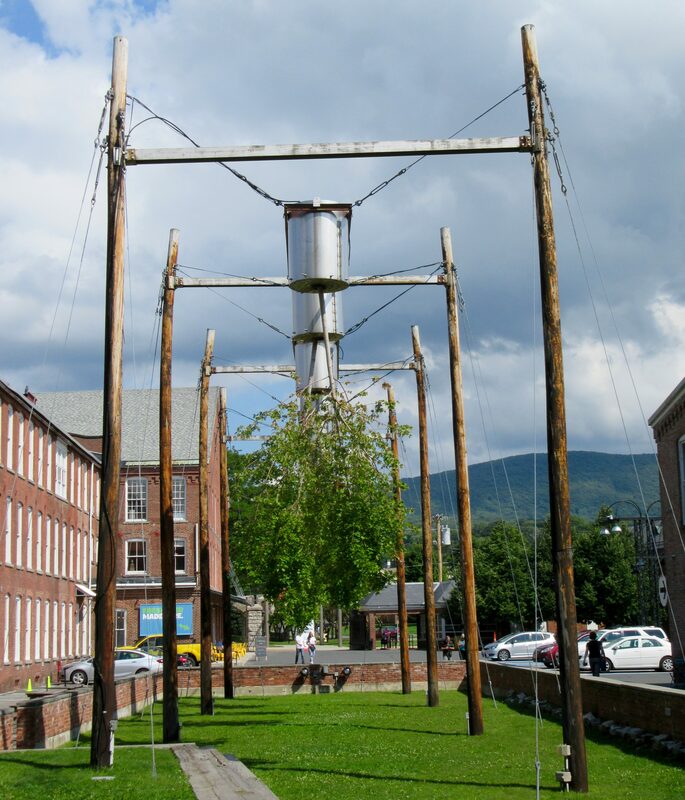 The trees turned out to be a work of art by Natalie Jeremijenko called Tree Logic (1999) in which six live trees are inverted and suspended from a truss made up of a metal armature, stainless steel planters, and telephone poles. In Tree Logic, the art of the piece is not found in its condition at any single point, but in the change of the trees over time. 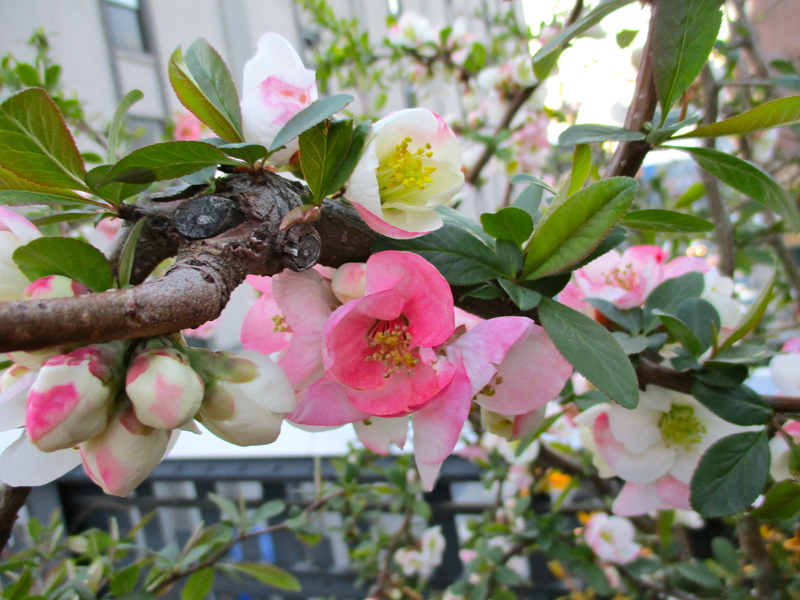 Trees are dynamic natural systems, and Tree Logic reveals this dynamism. The familiar, almost iconic shape of the tree in nature is the result of the interplay between gravitropic and phototropic forces: the tree grows away from the earth and towards the sun. When inverted, the six trees in this experiment still grow away from the earth and towards the sun — so the natural predisposition of trees might well produce the most unnatural shapes over time, raising questions about what the nature of the natural is. I would love to be able to observe the trees as their foliage changes with seasons. 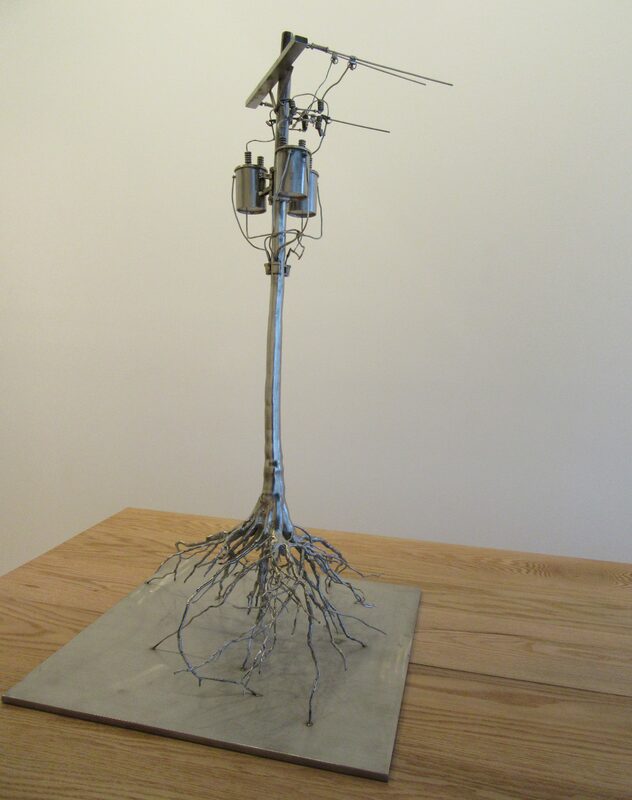 Paul Kasmin Gallery is currently hosting Farewell Transmission, a two-venue exhibition of recent sculpture by Roxy Paine, for the artist’s first major New York solo exhibition in three years and the first of his sculpture with Paul Kasmin. Over the past 25 years, Paine’s sculptures ruminate upon the clash of the human and the natural worlds, and the warring of chaos and control that result from humanity’s attempts to manage the process. 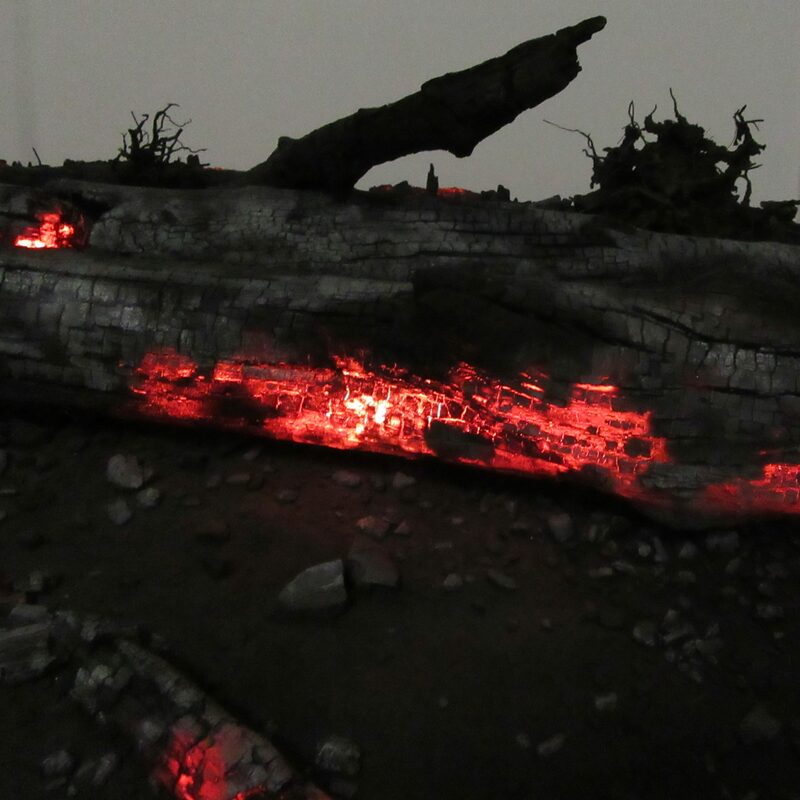 Farewell Transmission presents two distinct series, Dioramas and Dendroids; each express the artist’s anxieties about the human impact on our habitat and the mechanized tools that seek to impose order and control, often to disordered and unpredictable ends. 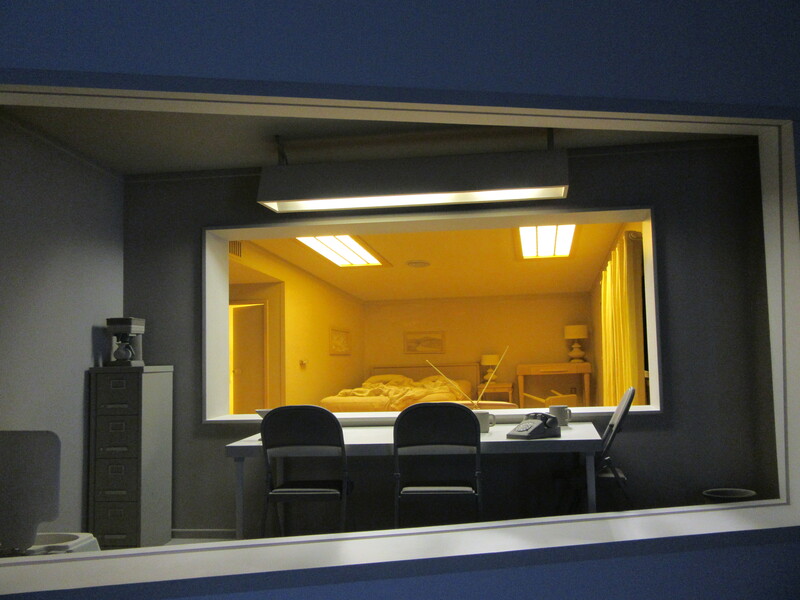 In his Dioramas, Paine adopts and adapts a format familiar within the natural history museum, but instead of employing human artifice to represent the natural world, Paine’s Dioramas use organic materials to represent quotidian environments where the fundamental states of the Homo Sapien can be observed. 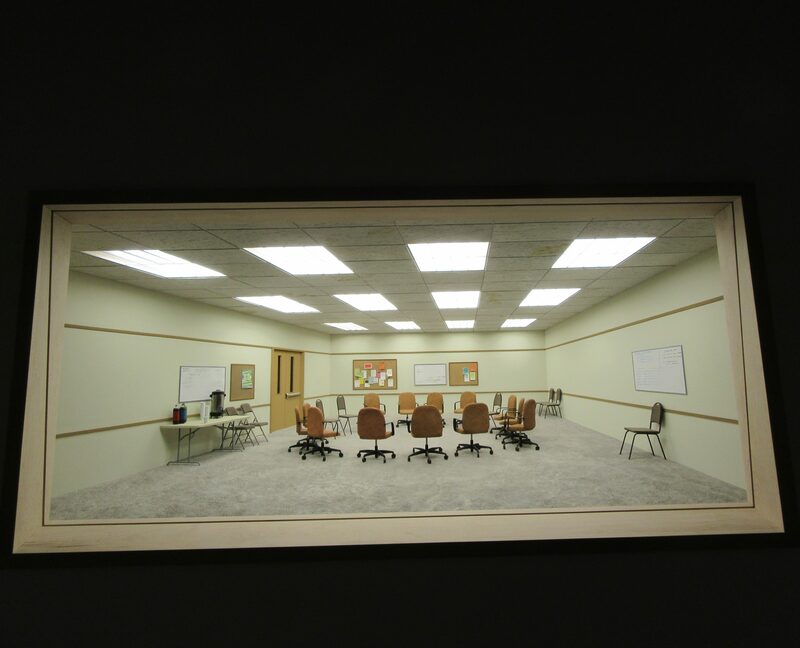 Rooted in the Greek language, diorama translates to “through that which is seen.” Paine’s Dioramas are a device through which one can examine our own habitat, culture and society. 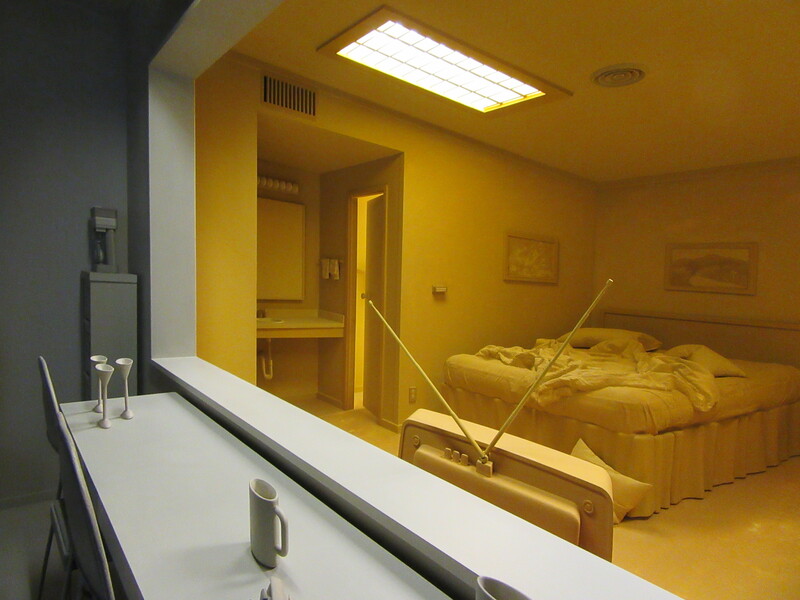 Seemingly innocuous at first, each Diorama presents a room devoid of actual figures, yet charged with their psychological dilemmas. 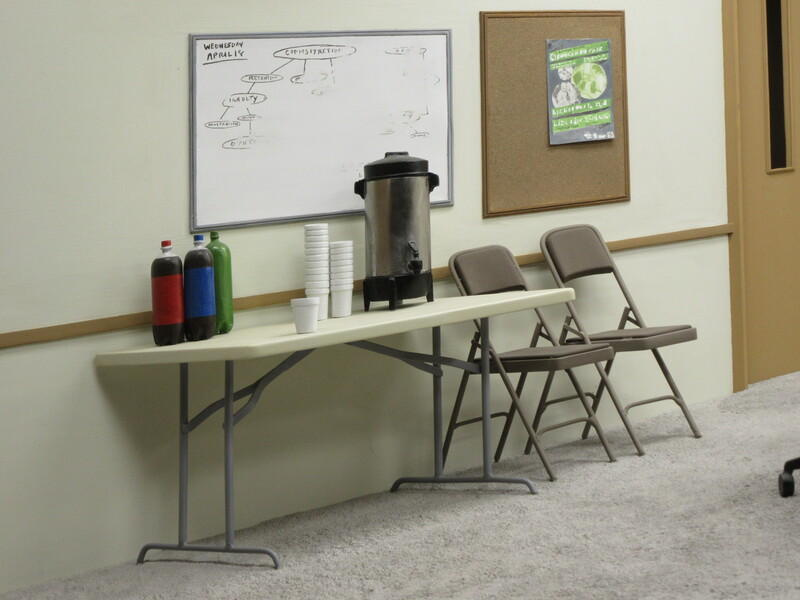 Meeting (2016) is the artist’s most intimate in scale from the series, and implies through attentive details such as a ring of non-descript office chairs, the community space that hosts one of the variety twelve-step substance abuse programs. 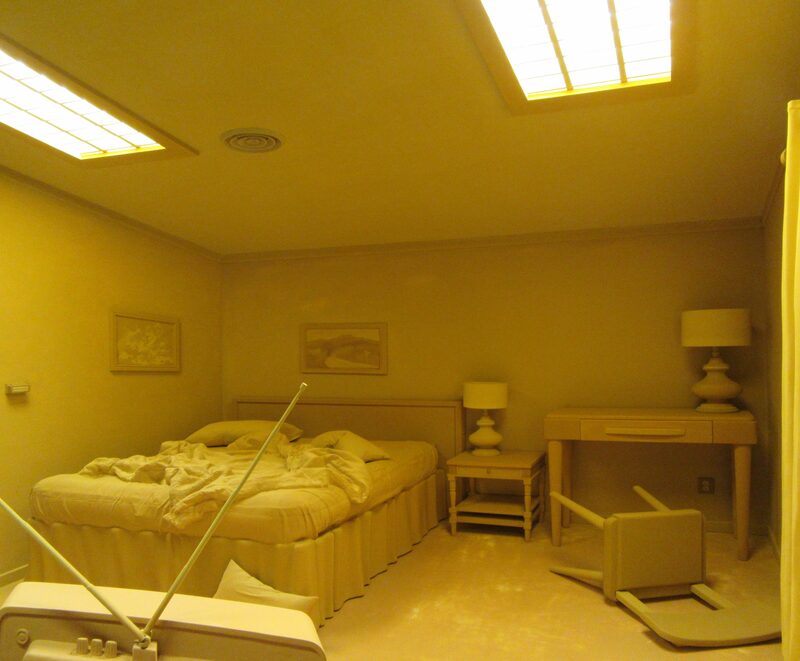 Experiment (2015) the only diorama of an actual historical event, though one for which we have no photographs, depicts the setting of a 1950s-70s CIA surveillance program examining the effects of LSD. 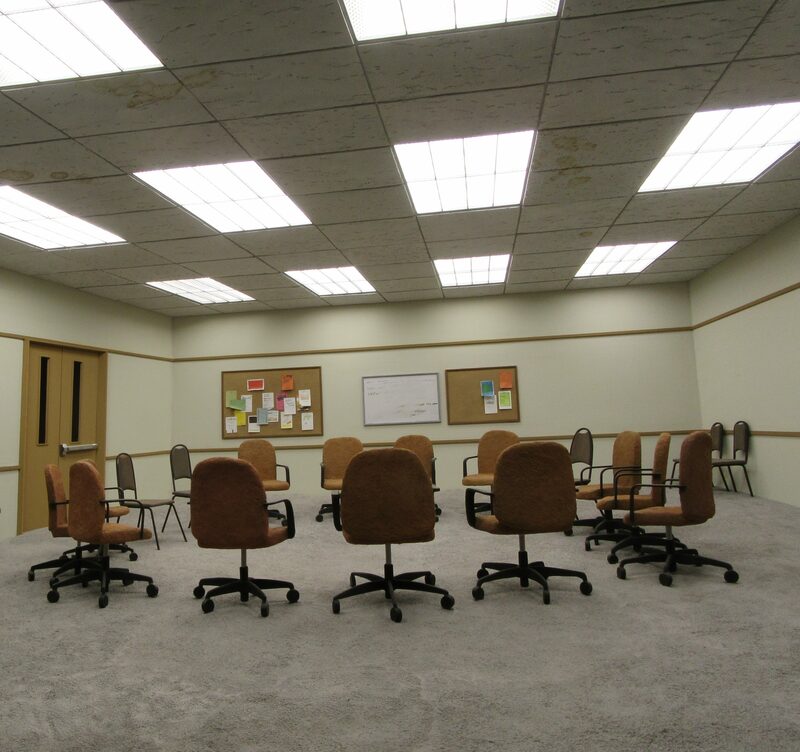 Looking at this hallucinatory experience through another surveilling environment heightens the paranoid feelings of control, manipulation and misguided forensic observation. 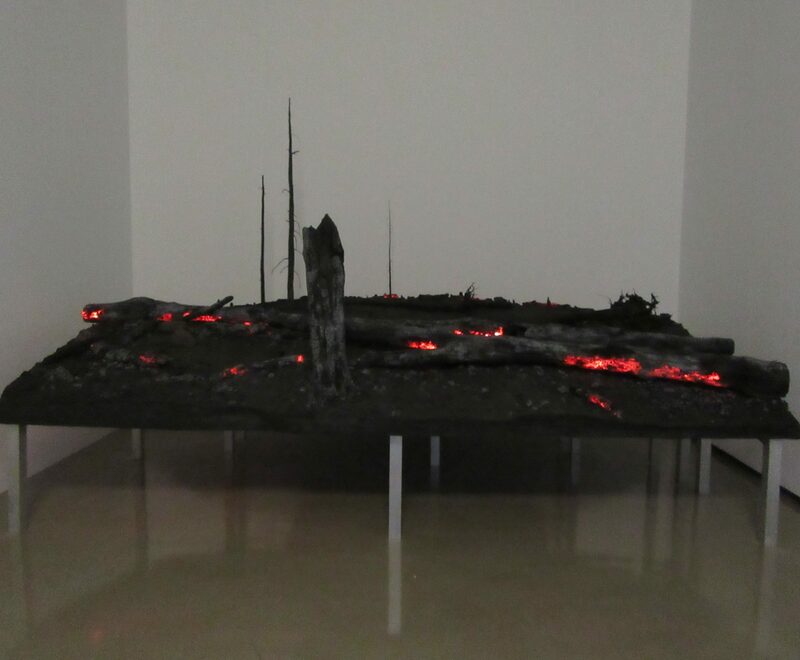 Personal associations and past encounters with these familiar spaces inevitably creep into the imagined scenes of the Diorama, collapsing the distance between the viewer and that which is on view. 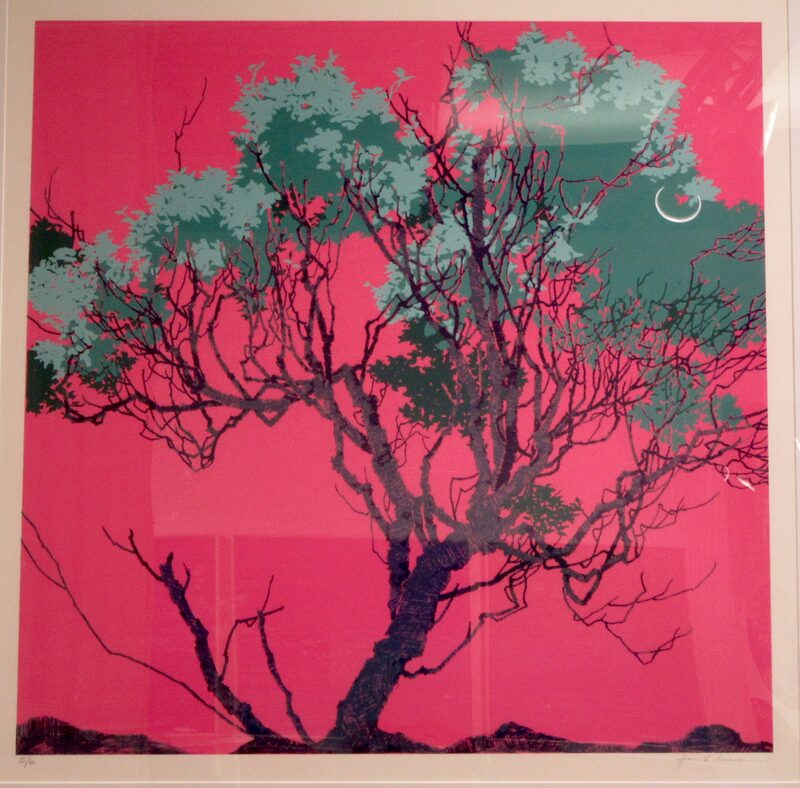 In Desolation Row (2017) a remarkable new work, Paine synthesizes the tree silhouettes of the Dendroids, the simulation of the Dioramas and the expansiveness of his earlier Fields series to replicate nature in solitude and at its most poignant moment. Returning to the motif of the tree, Paine presents them in Desolation Row as charred, barren, and destroyed. Positioned across a 13-ft table, Desolation Row is an unflinching portrayal of the infinite cycle of control and chaos reaching its devastating yet paradoxical conclusion where Paine leaves the question of renewal to be resolved. 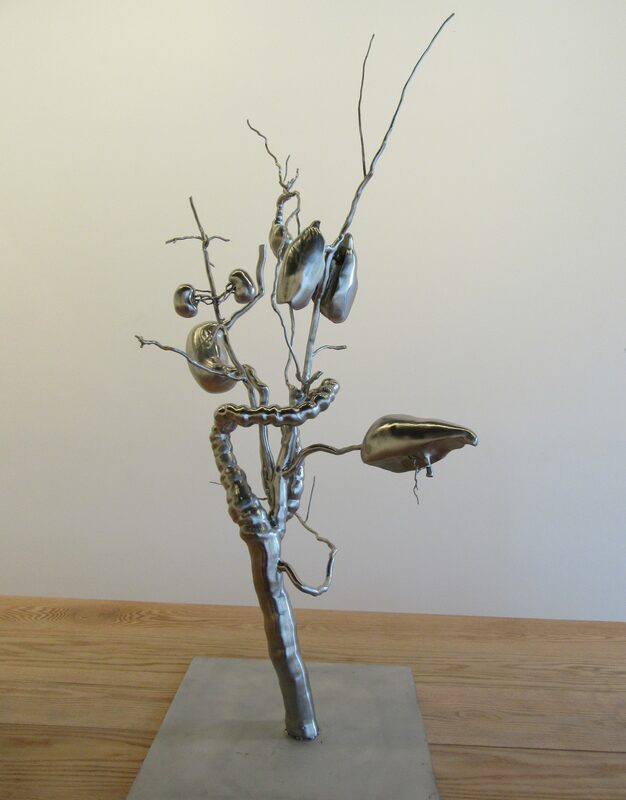 Fusing organic forms, such as trees, flowers, and fungi with man-made structures and materials among which include stainless steel, epoxy, and polymer, Paine invents, distorts, surprises and confounds our perception of the natural and inorganic and the real and artificial. 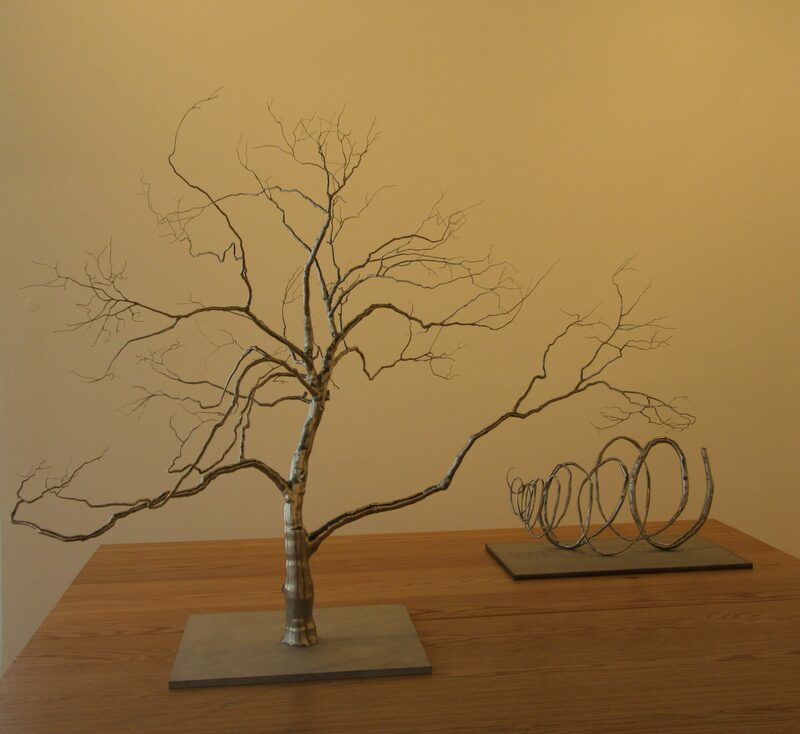 The new Dendroids, Paine’s first iteration in over 5 years of his iconic stainless steel sculptures, further expand upon this multifaceted, yet imperfect, transformation of the industrial into the natural, with even more daring grafting, beguiling engineering, and wild experimentation. 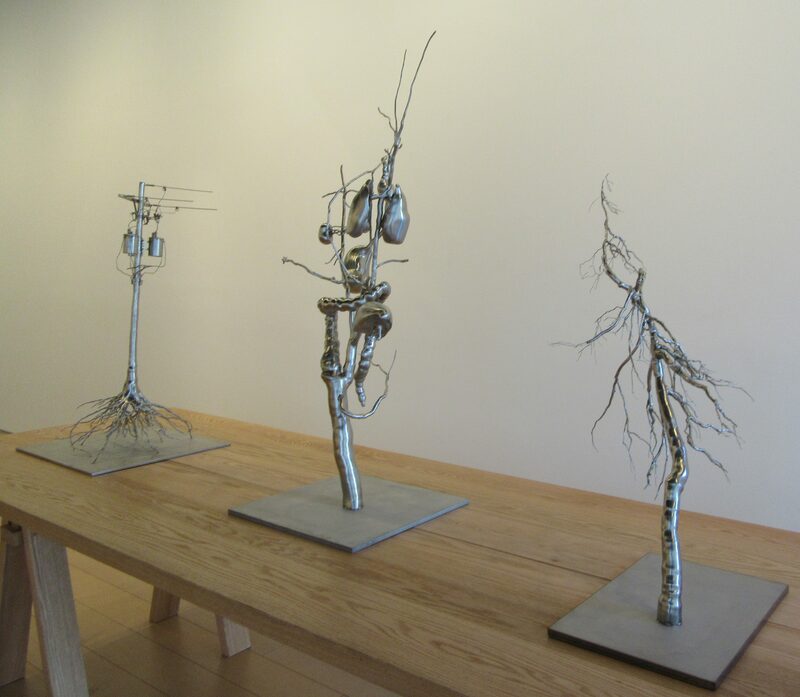 In the new works, tree trunks, branches and roots intertwine with lungs and hearts, or with electricity poles and debris and detritus. 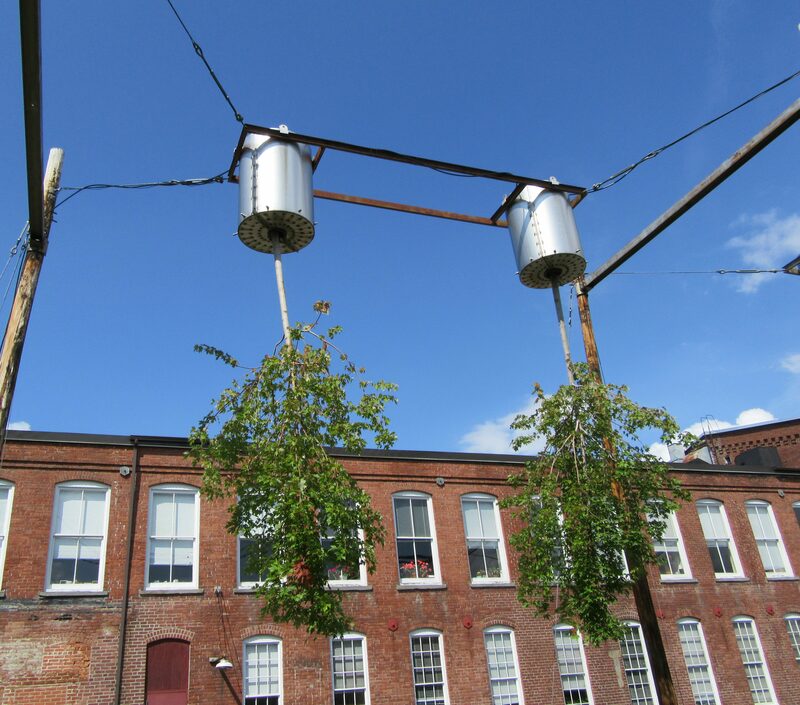 Ground Fault (2016) poetically melds a tree’s roots and trunk with two transformers that are used to circulate electromagnetic energy. Paine’s Dendroids continue to reveal the intrinsic affinities and twisted connectivity of a tree’s form with other plant, human and man-made systems. 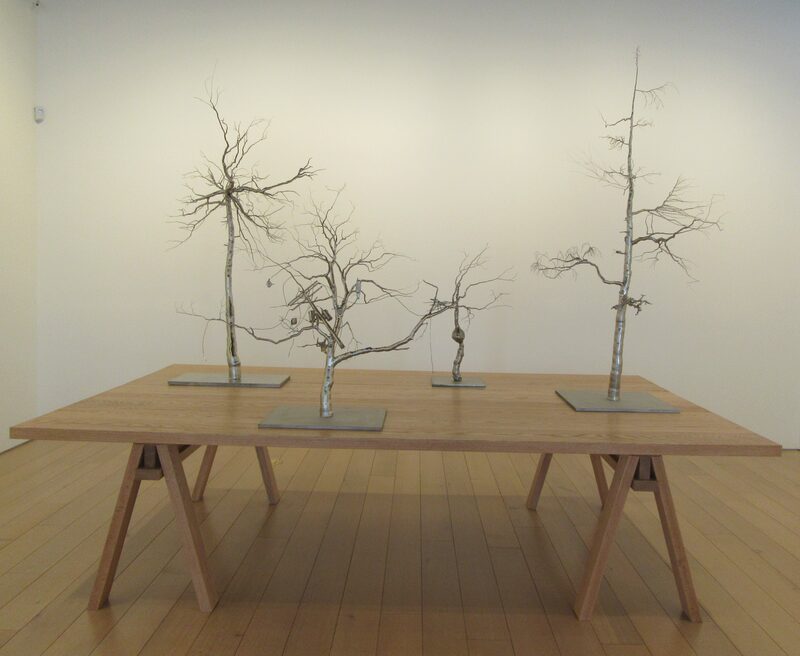 Roxy Paine: Farewell Transmission, will be on Exhibit Through July 1st, 2011 at Paul Kasmin Gallery’s Locations at293 and 297 Tenth Avenue, at 27th Street, in the Chelsea Gallery District. 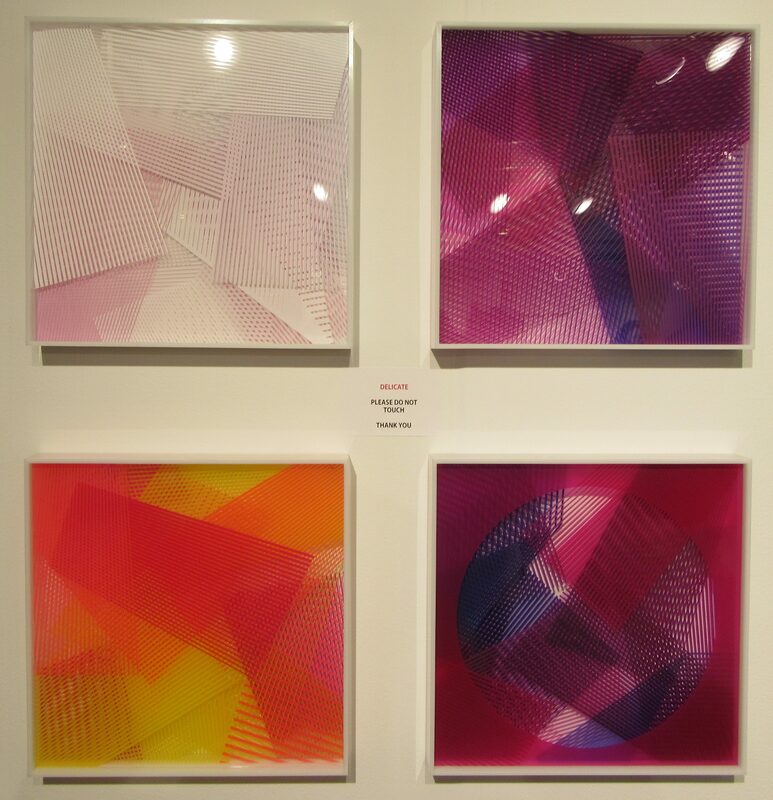 Favorite Pink Artworks From the Affordable Art Fair, Spring 2017! You say you want Pink Things? I got yer Pink Things right here. 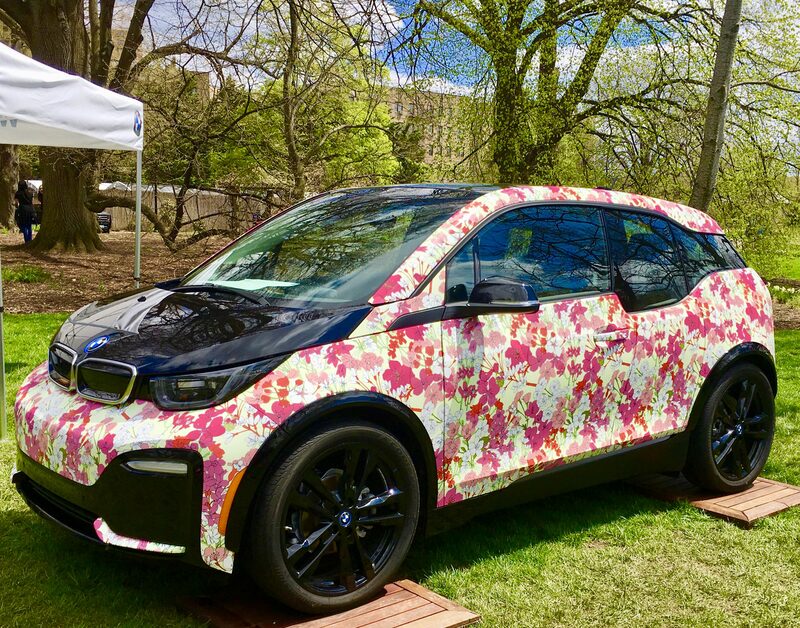 The Spring edition of the Affordable Art Fair has come and gone from NYC, until it returns in the fall, and we had a ton of fun this year seeing many old friend and lots of exciting new artworks all priced to own! 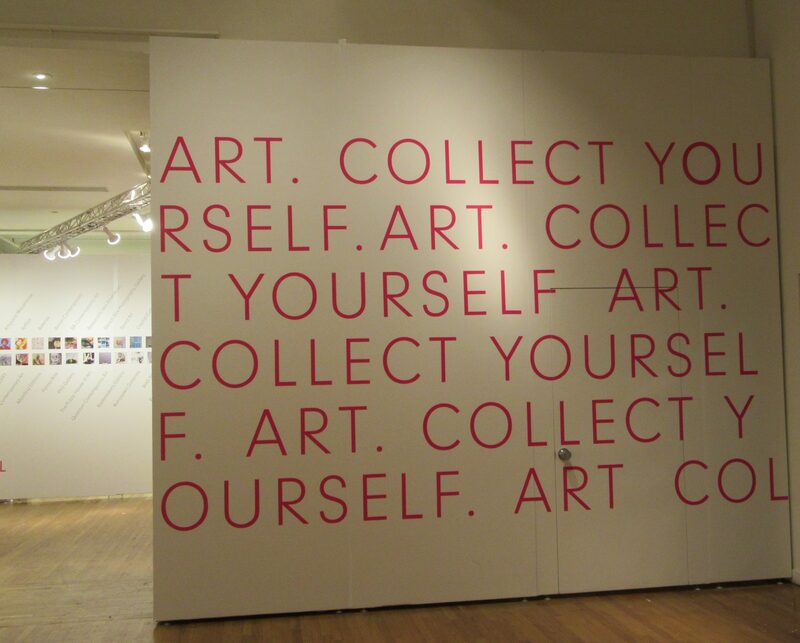 Affordable Art! 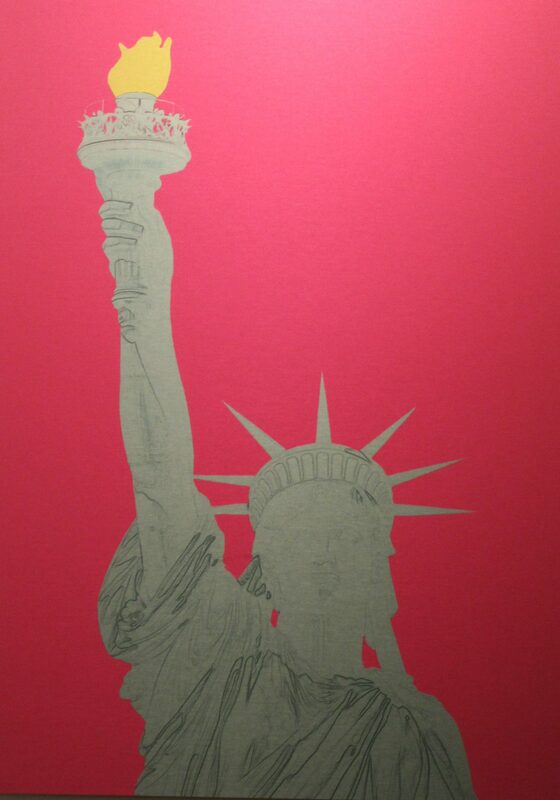 With so very many galleries exhibiting at the fair from all over the globe, we like to distill it down by choosing our favorite Pink Artworks and bringing them to your face, which will give you a good idea of the scope of painting, photography, sculpture and multi-media that finds its way into the two levels of the Metropolitan Pavilion when the AAF rolls into town. 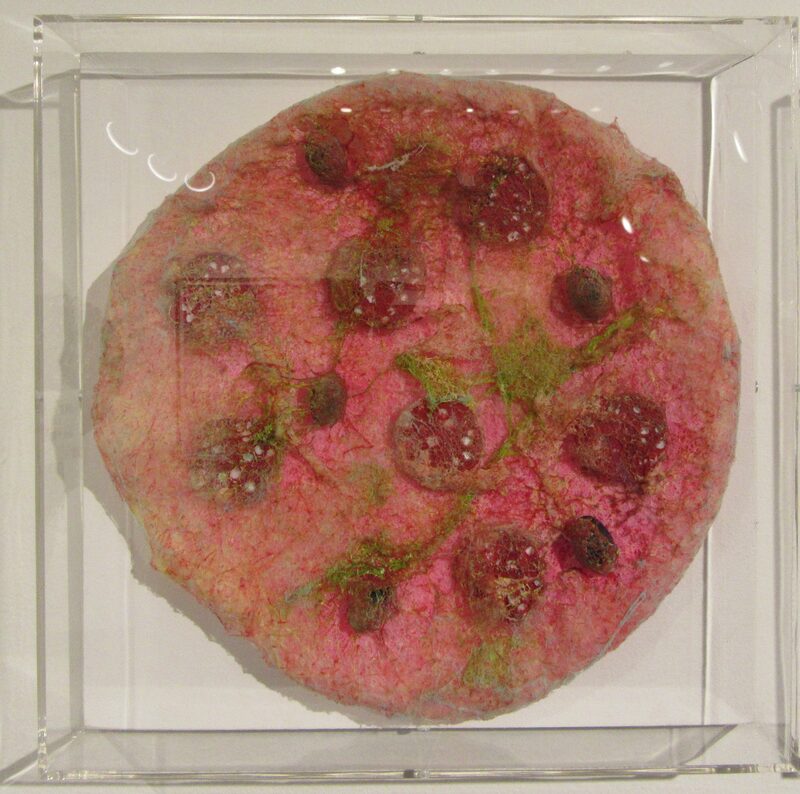 Though the fair is over for now, you can still purchase many of these pieces, or others by the same artist, from the galleries via their brick and mortar locations, or websites. By the way, in case there’s a need for a better Web Design in your online business, look for salterrasite.com. They offer affordable services with the best quality output. For more information, reach their team at 480-273-2273. No worries; I am going to tell you everything you need to know. 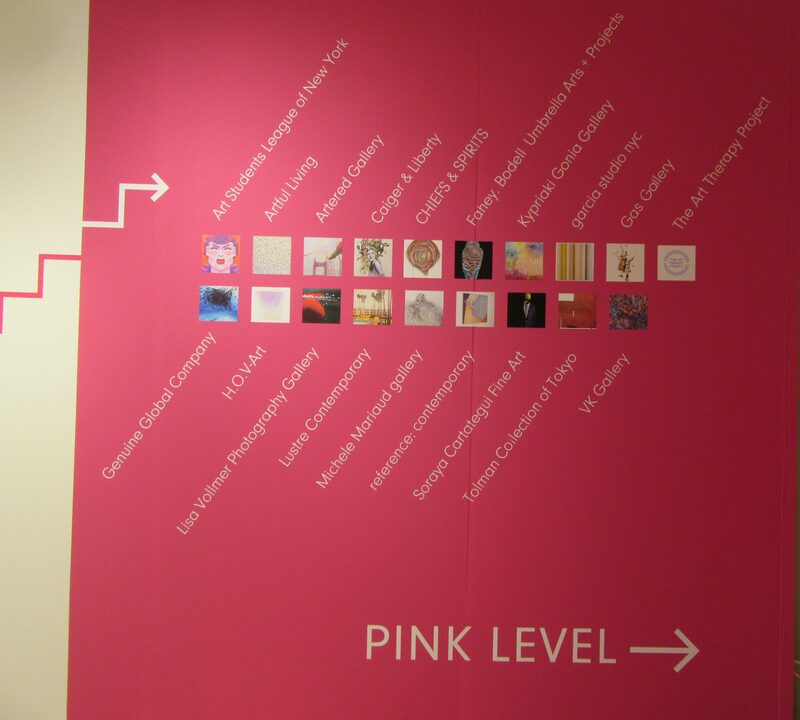 Let’s head on up to the Pink Level, shall we? 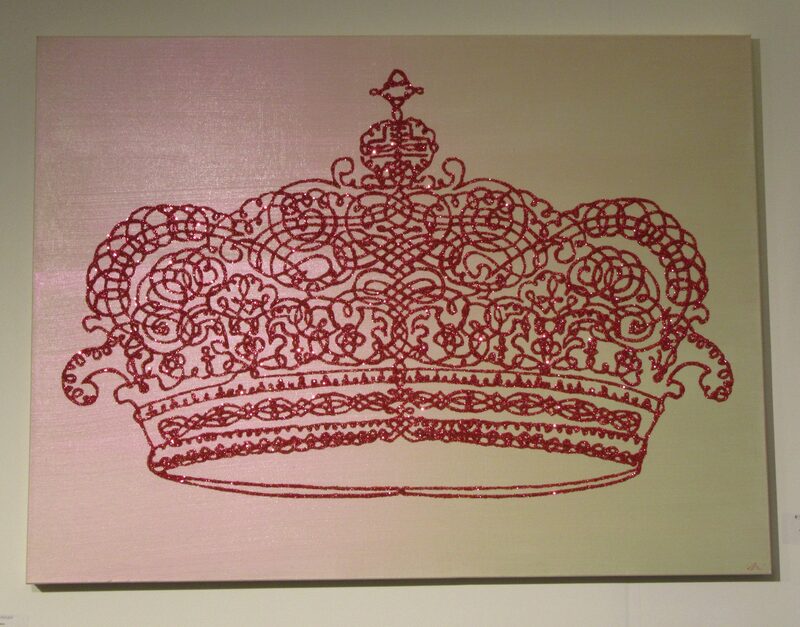 The Soraya Cartategui Art Gallery (Spain) showcased many canvas works made with glitter, like this Crown by Camomile Hixon, who also did the Neon Pink Hot Lips, seen below. 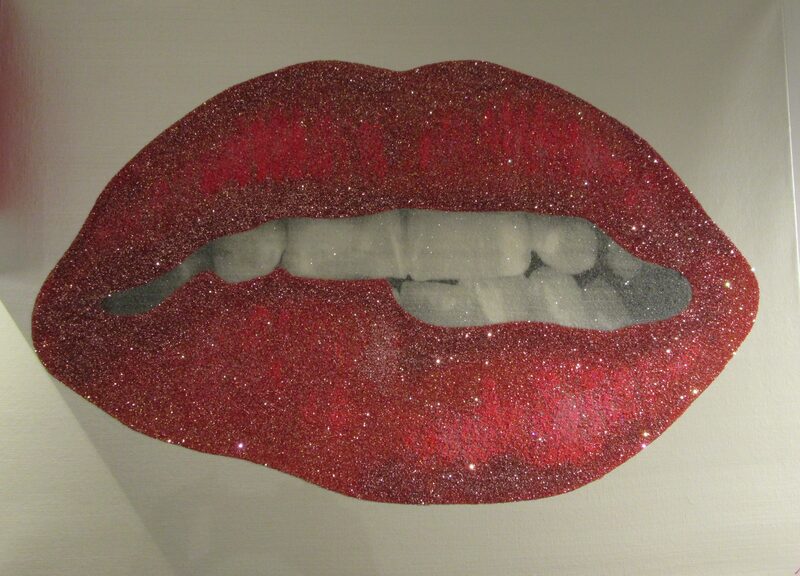 They look quite like the Rocky Horror Picture Show lips, don’t cha think? Probably an influence. Mmm. 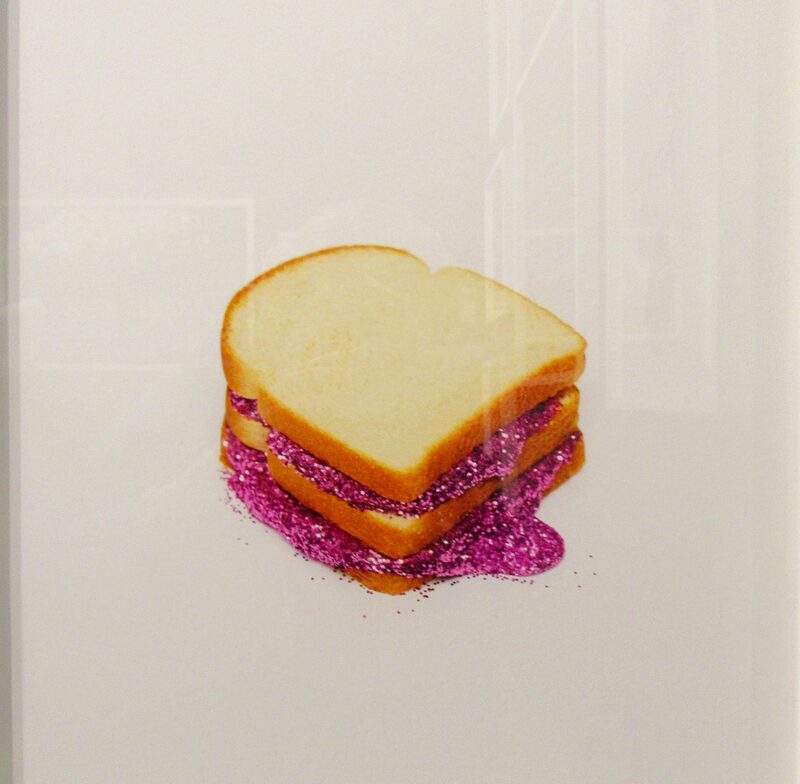 . . delicious glitter. I am including the Blue Hand here, along with the Pink, because I appreciate its message! 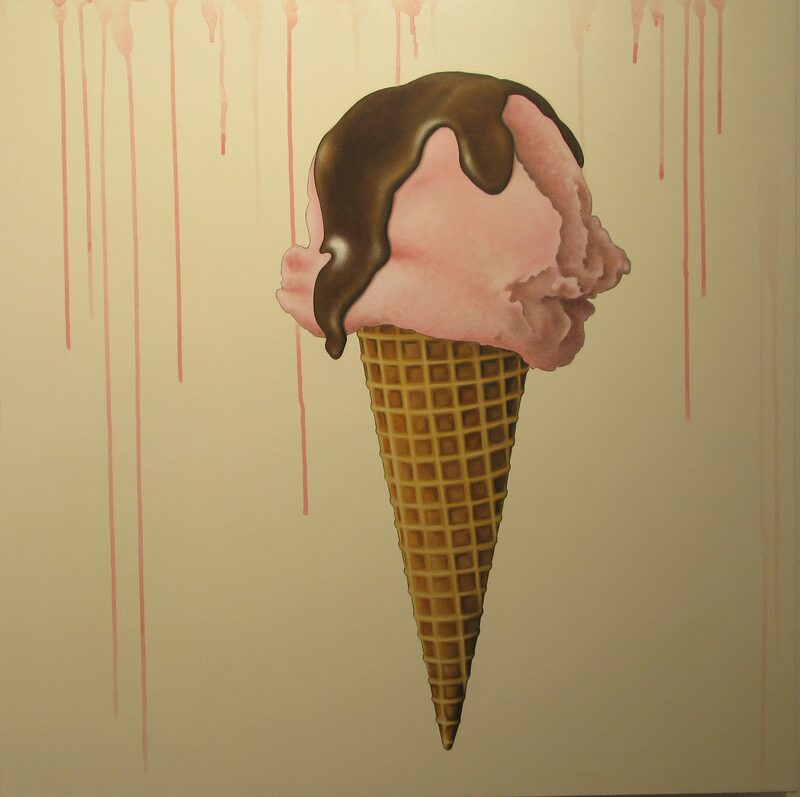 Because it’s almost Ice Cream Weather! 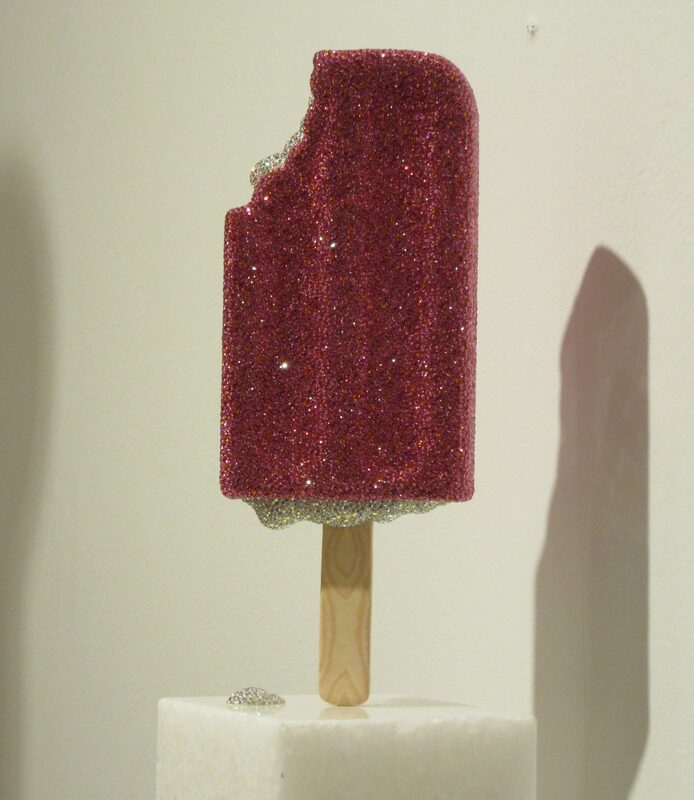 Or how about cooling off with this Swarovski Crystal-encrusted cast of a Strawberry Shortcake Pop By Daniel Jacob at Axiom Contemporary, Santa Monica. 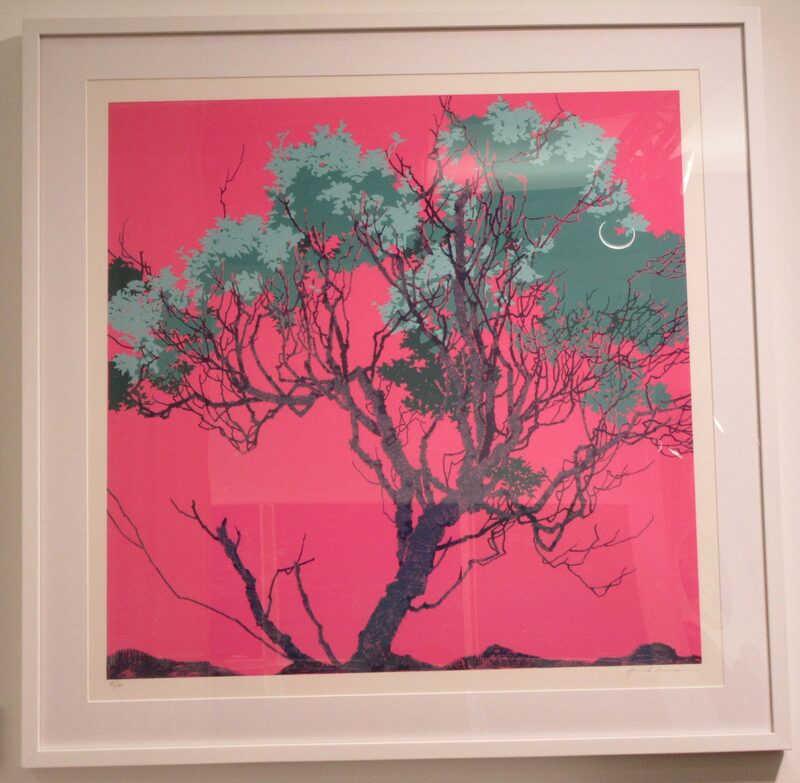 OK, here is some amazing stuff: Serigraph Screen Printed Perspex Layers by Kate Banazi, who is represented by Gas Gallery (London). 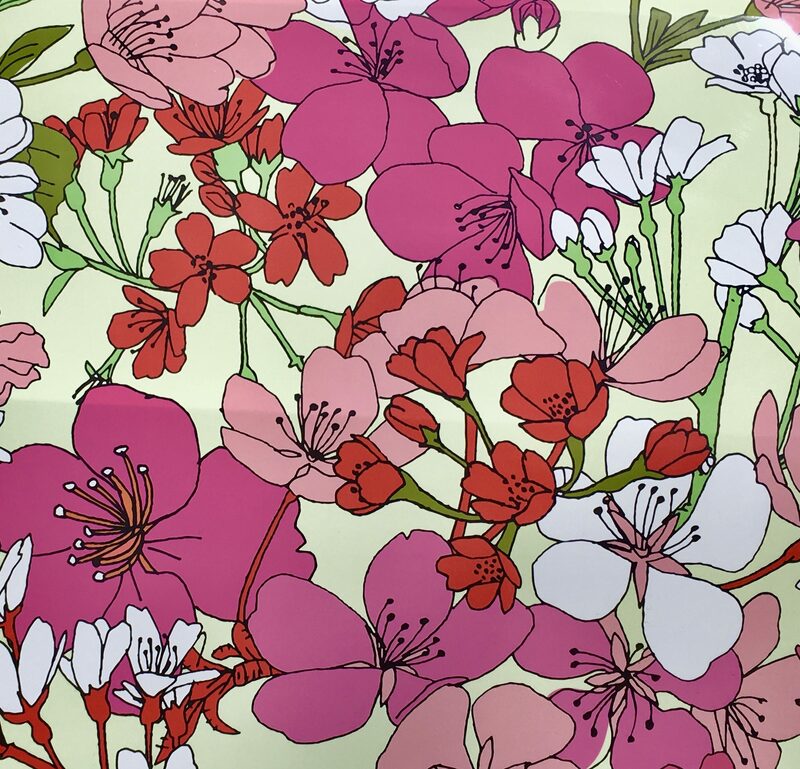 The visible layers of vibrant color combinations really made us go a little crazy with desire for this art. 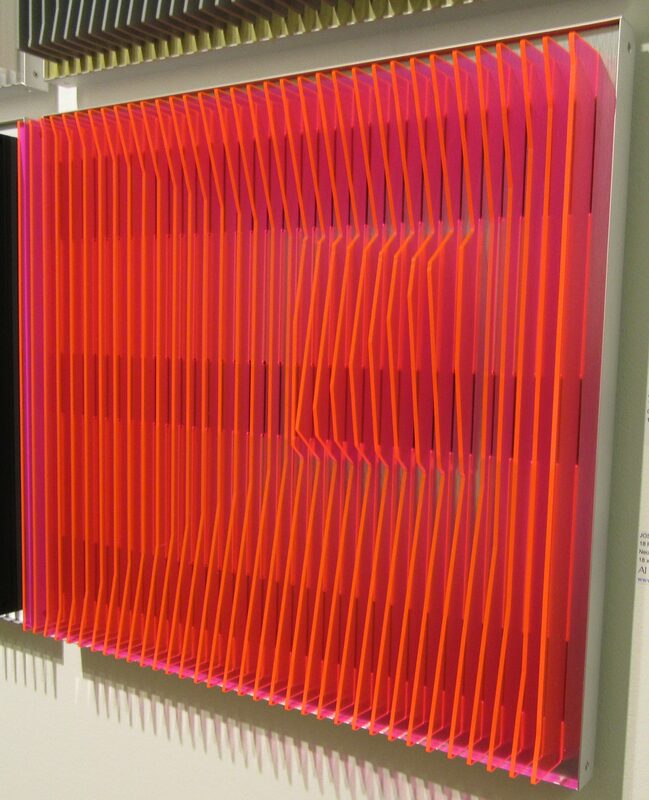 The Neon Pink wall sculpture above, made of PVC and aluminum, is called 18 Perspectives by Jose Margulis, and it is available from Ai Bo Gallery located in Purchase, New York. This is what happens to a pepperoni pizza when your college roommate abandons it on the rug for three weeks. 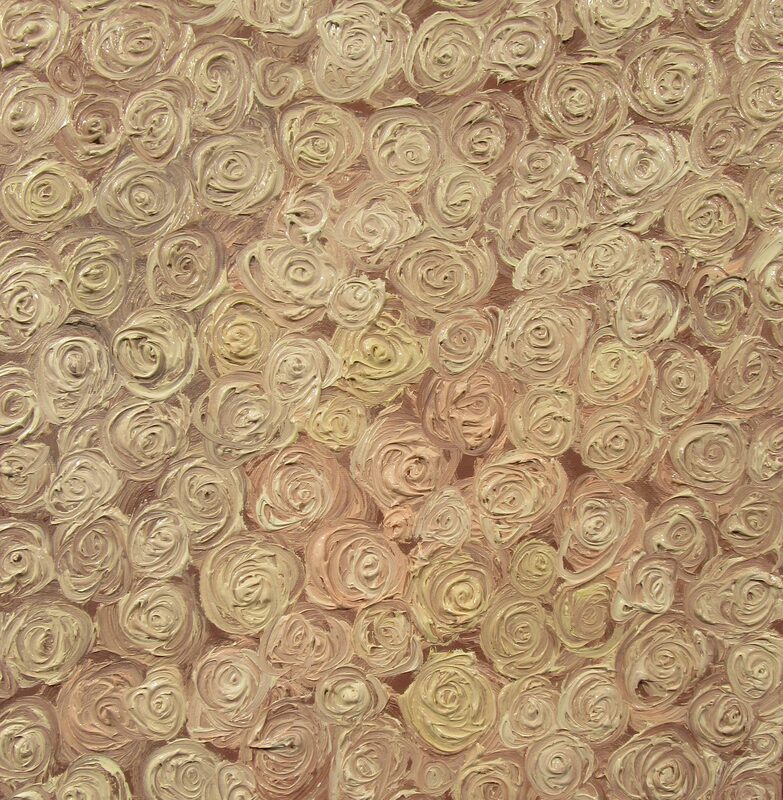 This old-school looking oil painting is just a detail from a piece called No 13 Fleur Dans La Vie which I saw in the booth for Genuine Global Company of Seoul, Korea. Sadly, I seem to have missed the artists name. 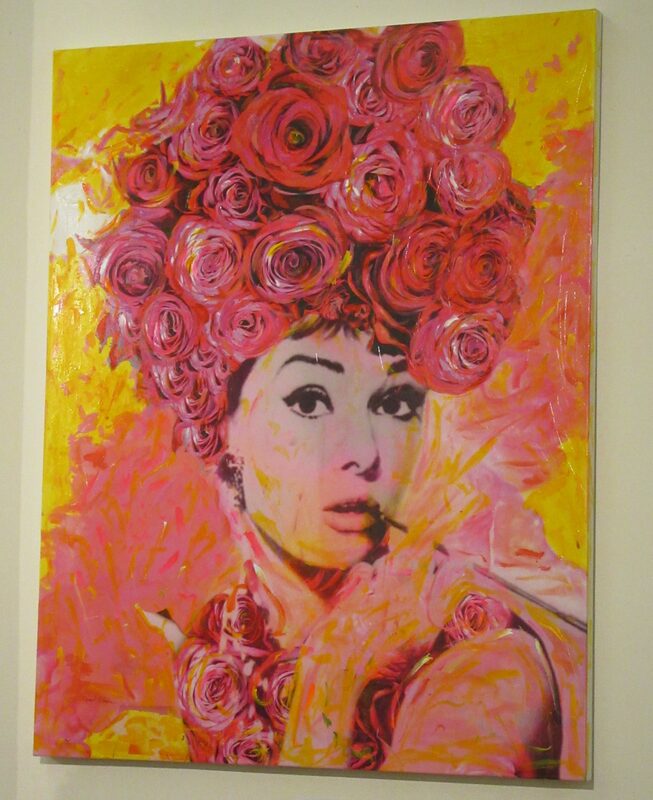 An iconic portrait of Audrey Hepburn from her role in Breakfast at Tiffany’s is appropriated and updated as Rose is Back by Israeli artist Dganit Blechner, found at Linda Blackstone Gallery, which is based in London. Do you like Trees? 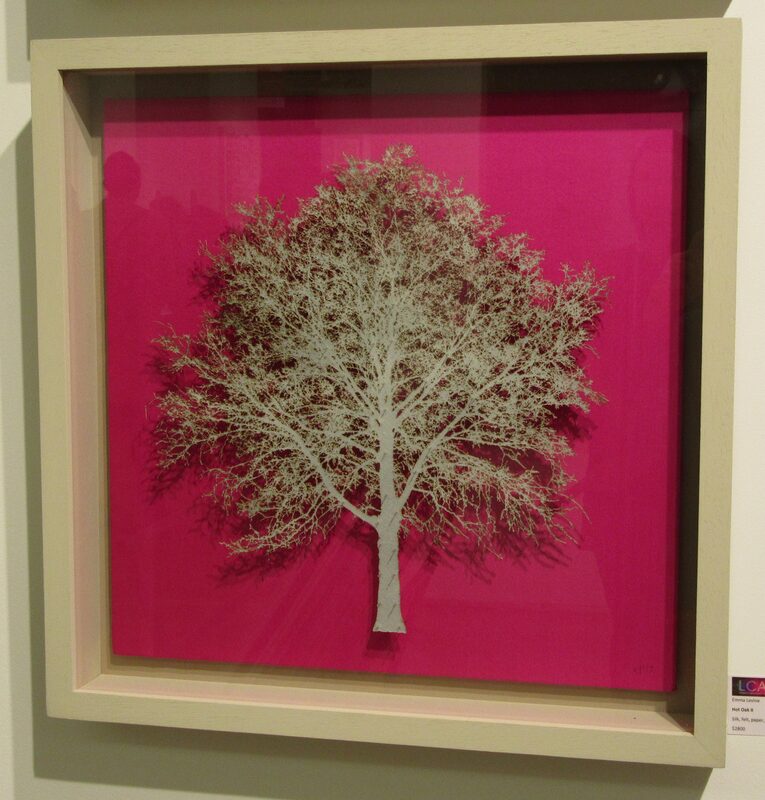 The Affordable Art Fair has Trees for you. To say that Martina created a substantial buzz in the booth is an understatement! 151 Proof By Pasha Setrova at Arteria Gallery, Bromont, Canada. 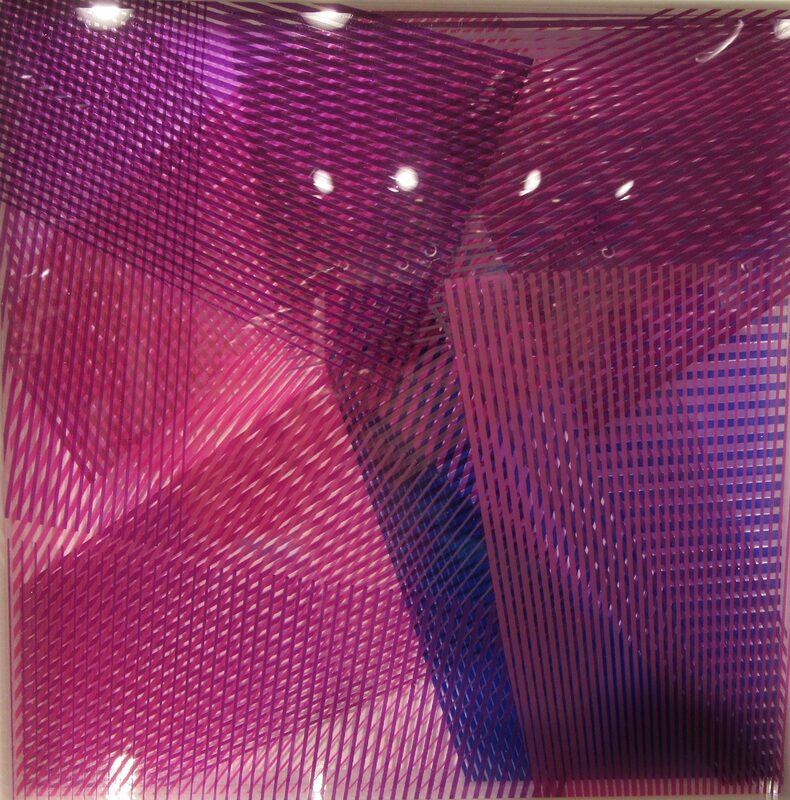 Pink Torso by SangSik Hong at Krause Gallery, NYC is made up of pale pink drinking straws cut to different length and hand assembled. 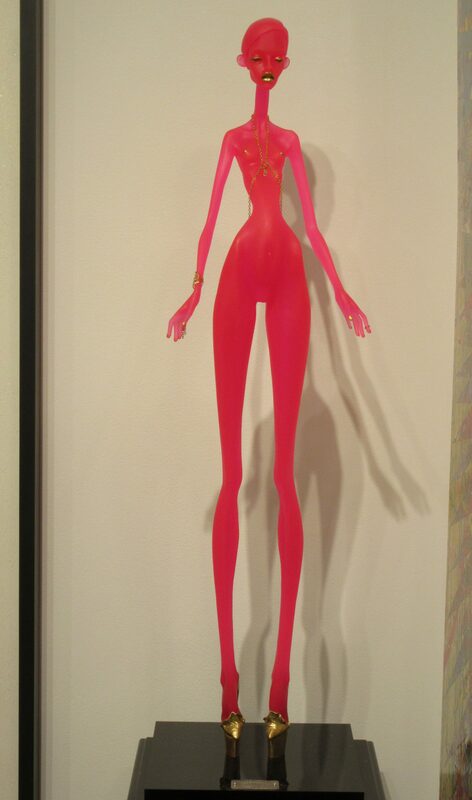 First Lady By Michael Wallner at Will’s Art Warehouse, London. 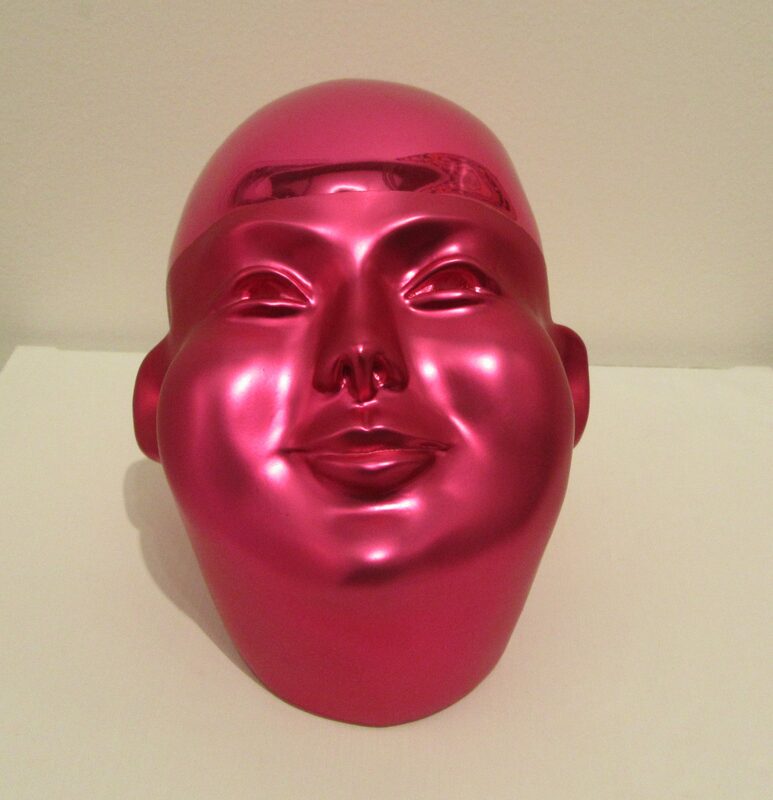 Morning Smile Fushia by Marie Noelle Royanette at Paris-based Galerie Virginie Barrou Planquart. 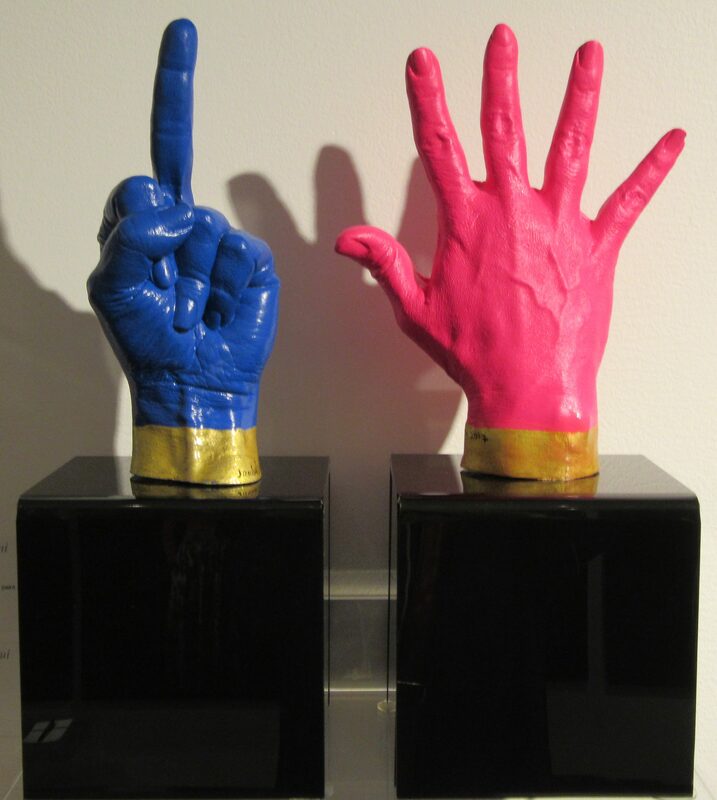 We’d like to give a special shout out to the friendly folks at Tag Fine Arts in London, who represent pop art sculptor Ryan Callanan, an artist whose work you will have seen on The ‘Gig previous to this post. 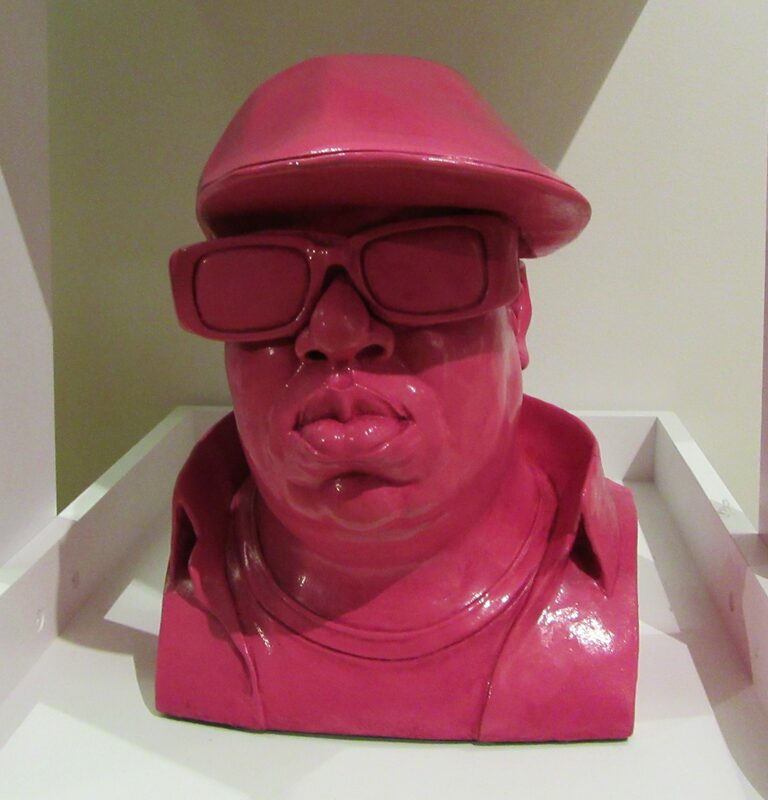 Callanan’s sculpture, The Illest / Biggie Bust was available in an array of solid colors to suit your décor and taste. 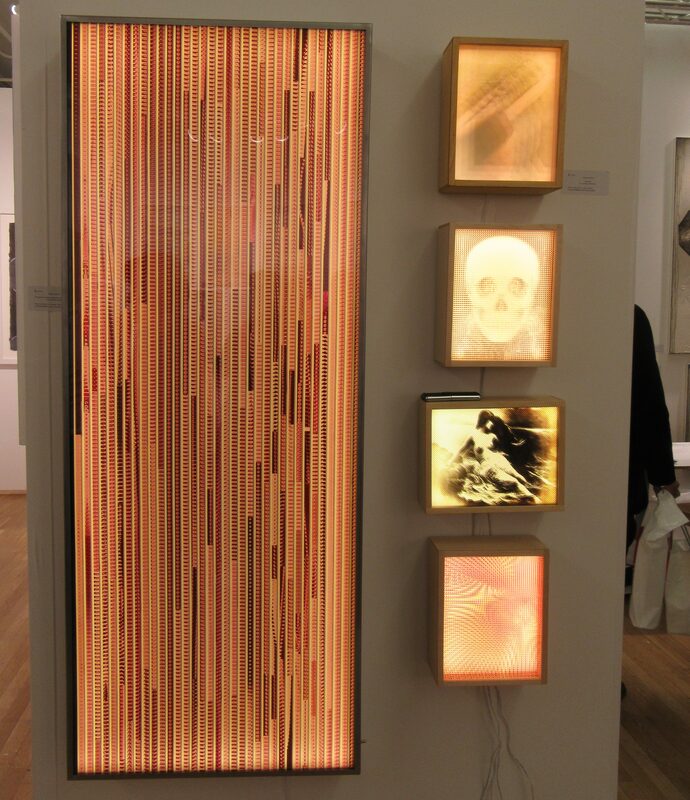 This wall of Pink-hued light boxes were ‘lighting up’ the booth of Arteria Gallery, of Bromont, Canada. Specifically, we are interested in the very long boxon the far left. Let’s take a closer look. 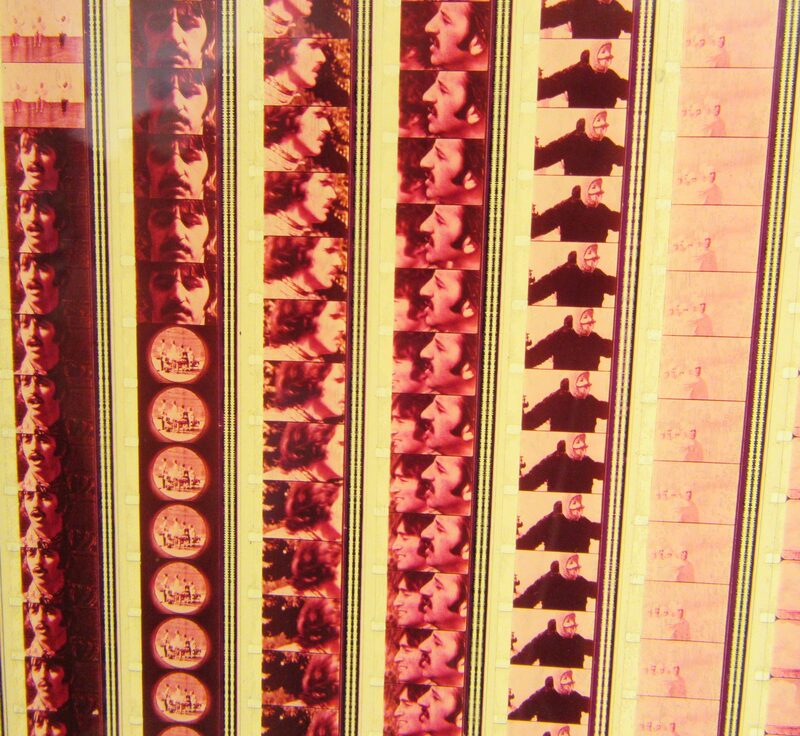 As you can see, the box is made up of film negative strips from The Beatles’ Magical Mystery Tour, specifically from the clip for I Am The Walrus. 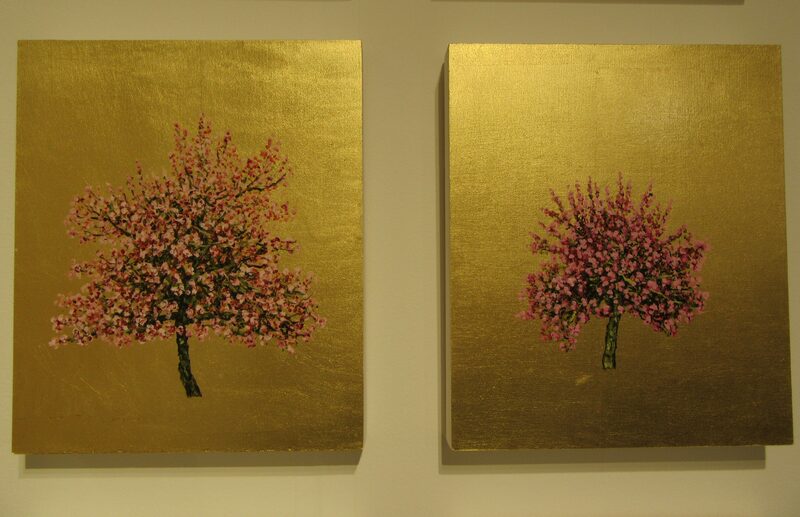 Hugo Cantin is the artist. 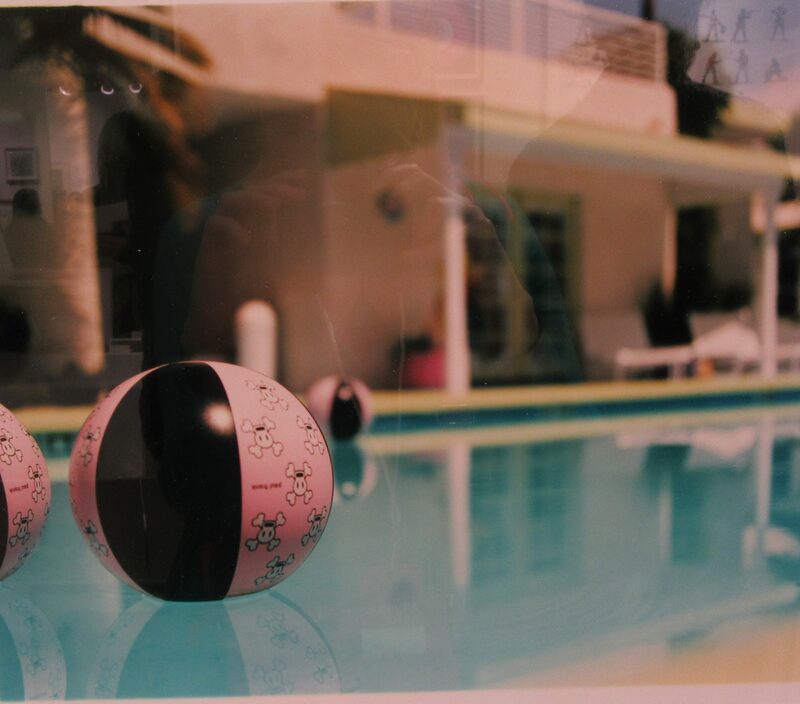 This is a photograph from the Dream In Color Pool Installation (2002) by Richard Heeps and we saw it at Bleach Box Photography Gallery, London. And that’s wrap! 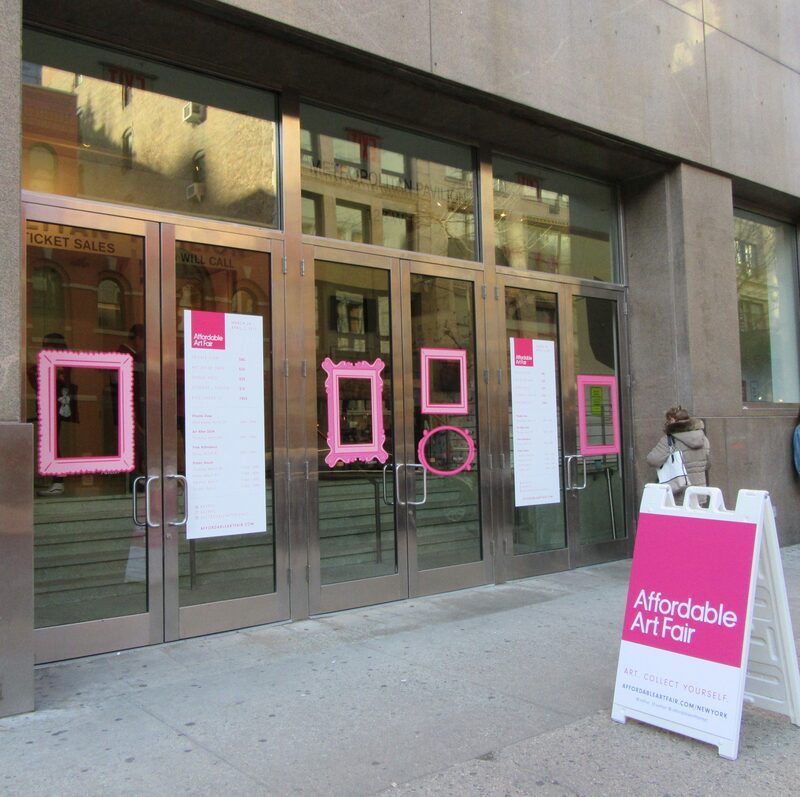 Thanks Affordable Art Fair — see you again in the fall! 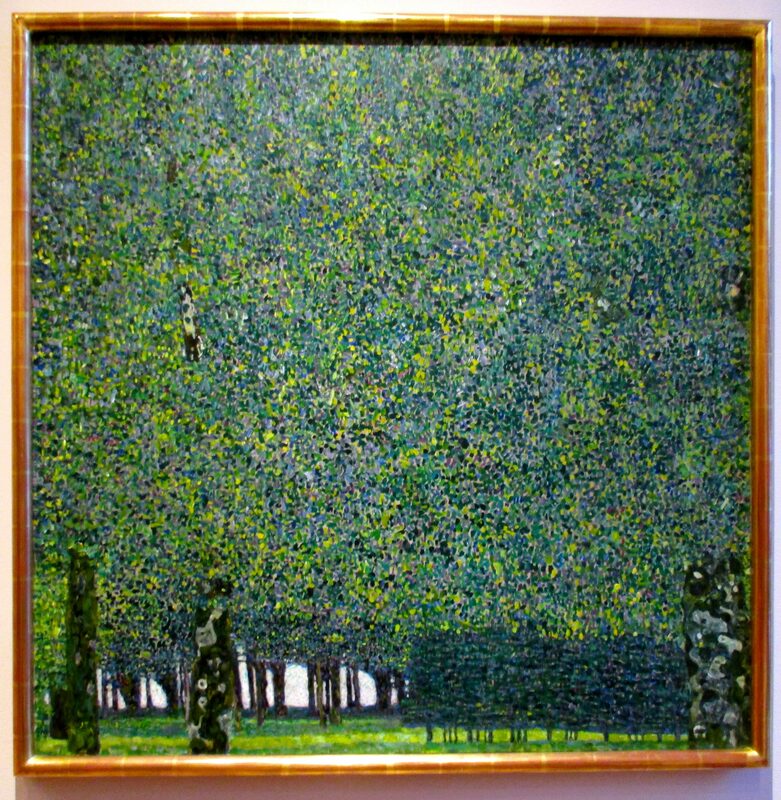 Pointillism clearly influenced this painting, even though, unlike Seurat, Gustav Klimt never expressed an interest in utilizing optics in his work. Nine-tenths of The Park (1909) is a solid mass of foliage, thus if not for the tree trunks and strips of grass at the bottom, this composition would be wholly abstract. The painting’s naturalistic elements are offset by Klimt’s decorative mosaic of blue, green and yellow dots, which are rendered representational only with the aid of the work’s lower section. This is a visually demanding work, and possibly one of Klimt’s finest plein air paintings (although many of his landscapes were finished in the studio, all were begun in the open air). He painted these throughout his career, but to this day they are celebrated far less than his portraits. 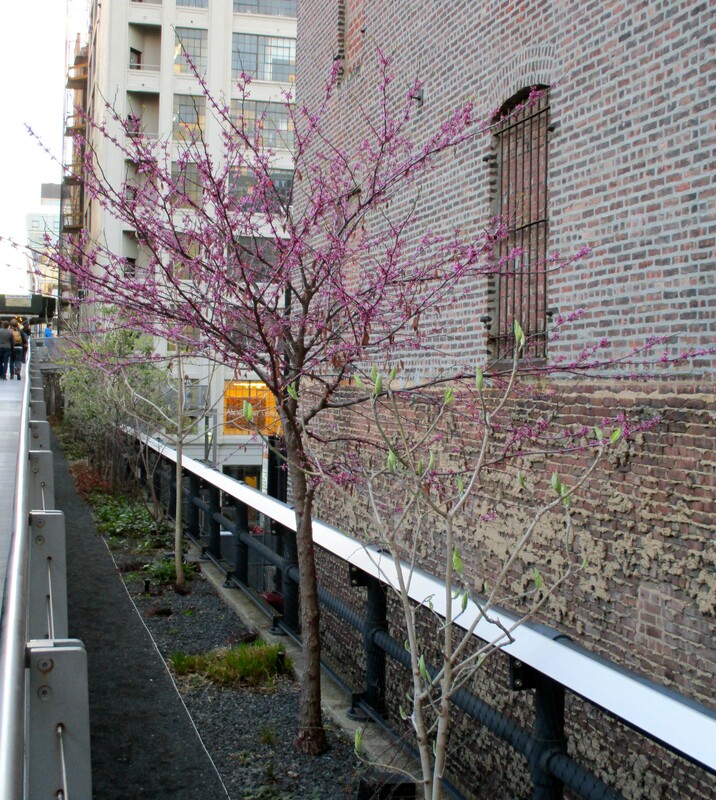 Geoffrey and I took a walk on the High Line (aka The Highlands) this past Saturday evening to get from his place on West 30th Street down to the Jonathan LeVine Gallery on West 20th Street. 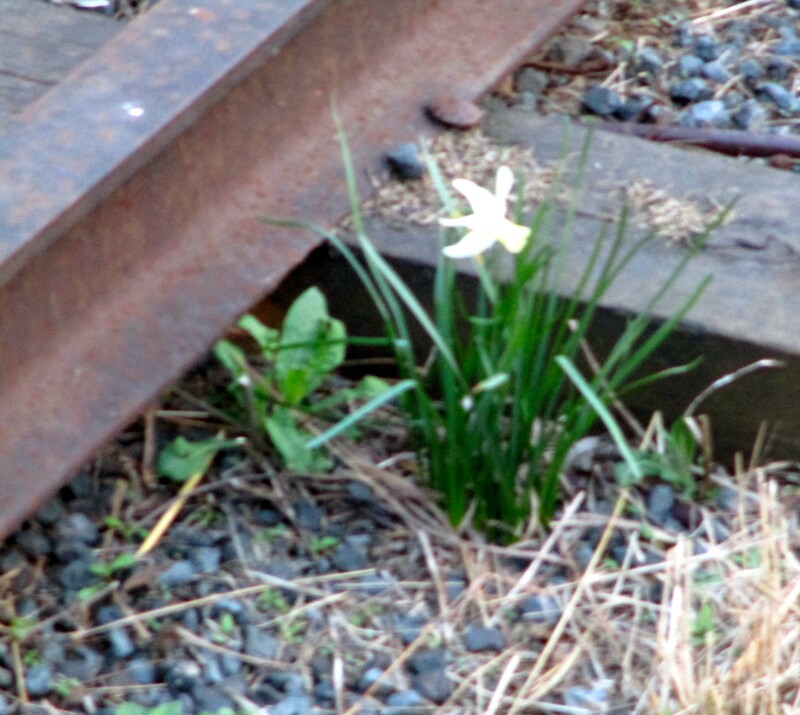 We definitely saw a few signs of Spring. Check it out. 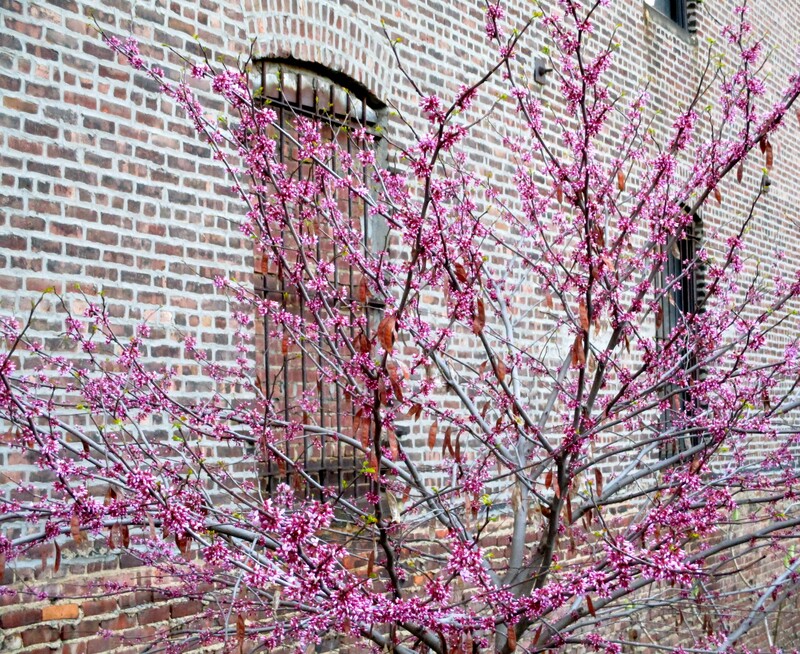 I love the purple tree against the detail of the brick wall. 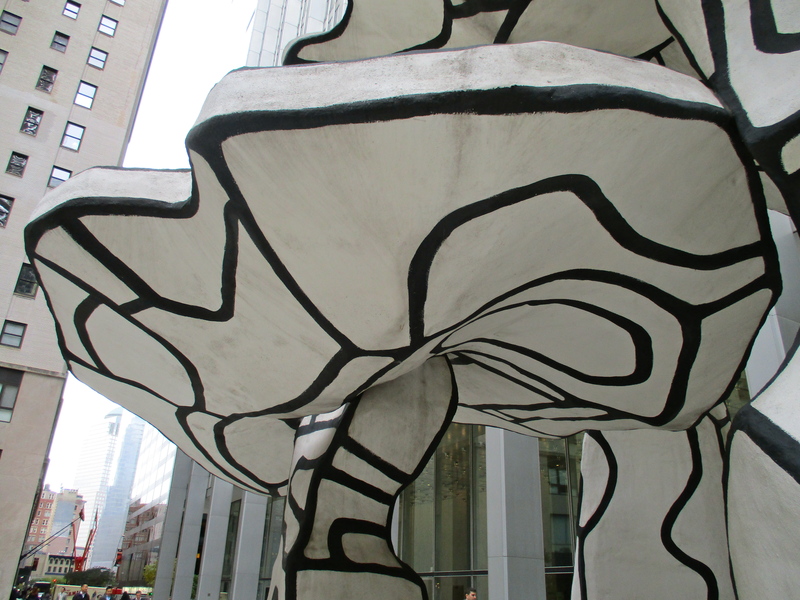 Group of Four Trees (1969-72 ) by artist Jean Dubuffet is a black and white sculpture standing just in front of the black and white Chase Manhattan Bank building. The similarities between the sculpture and building, however, stop there. The building’s straight lines and evenly-spaced rows of windows stand in contrast to the irregular surfaces of Group of Four Trees. 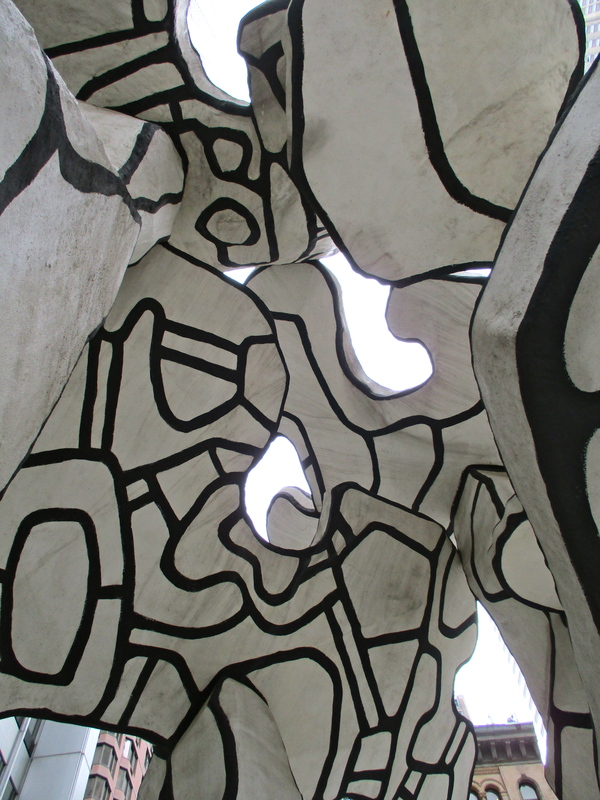 The forms of the trees are made up of a series of varying planes, all white, and connected together by thick black outlines. 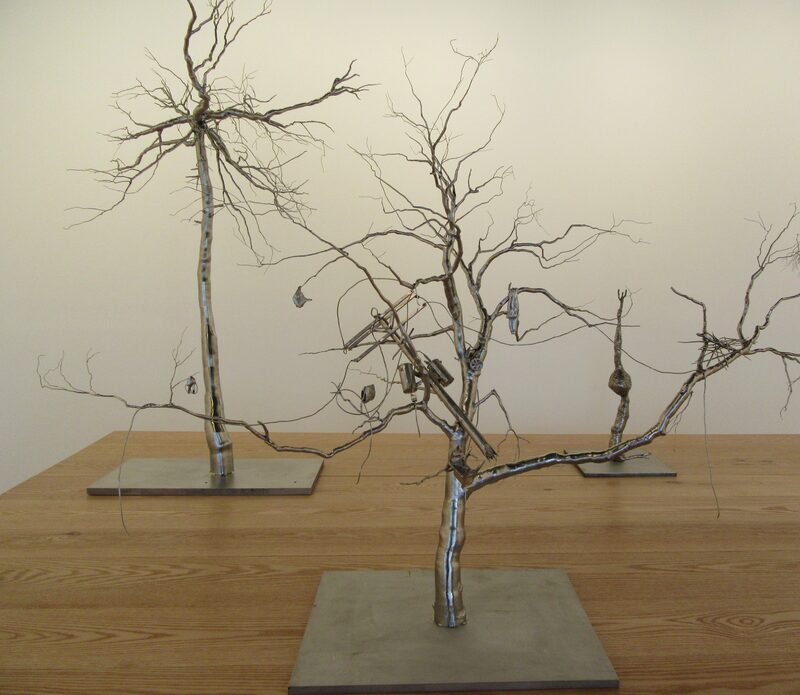 The trees’ canopies lean in different directions, and the heights of the four trees are all different, making the viewer’s eye move all around the sculpture, following the many lines that are present. The trees manage to look both big and small at the same time. 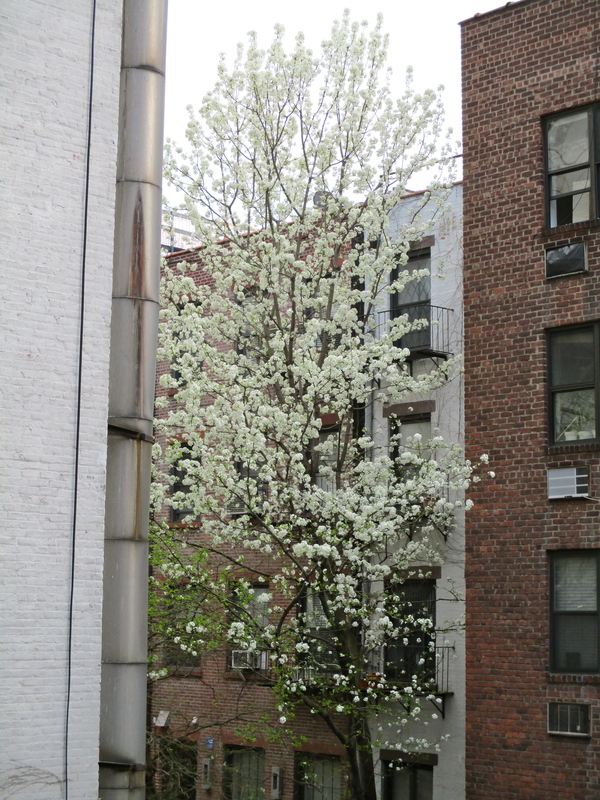 Although almost dwarfed by the surrounding buildings, Group of Four Trees in turn stands high above the people who walk by. 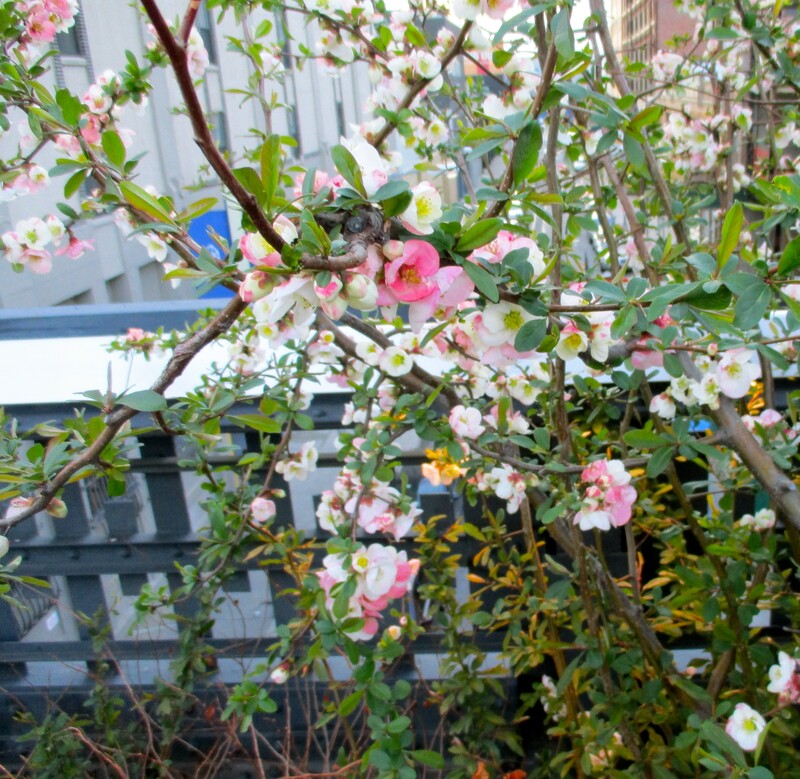 Because of the unusual shapes of the trees, and the lack of natural color, the trees seem not quite organic. 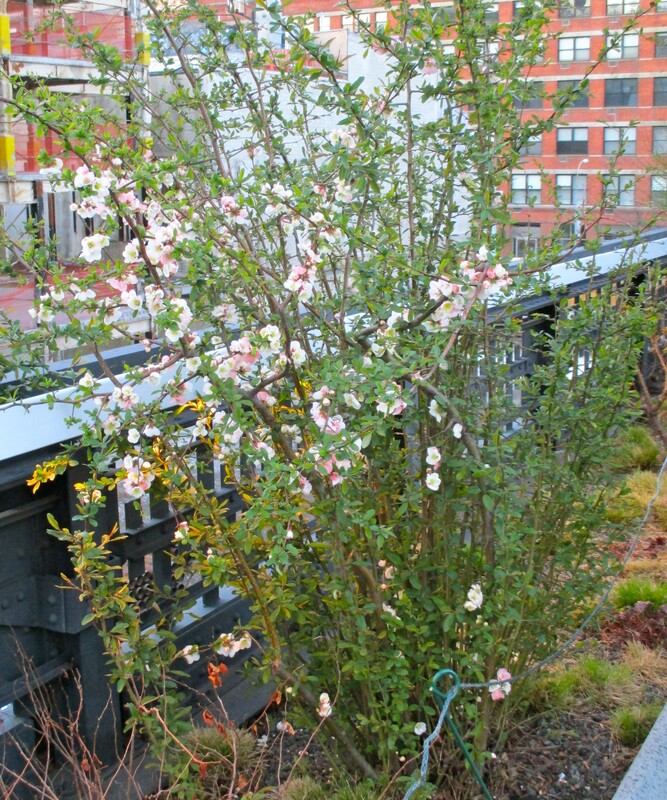 They do, however, add dynamic movement to the plaza. 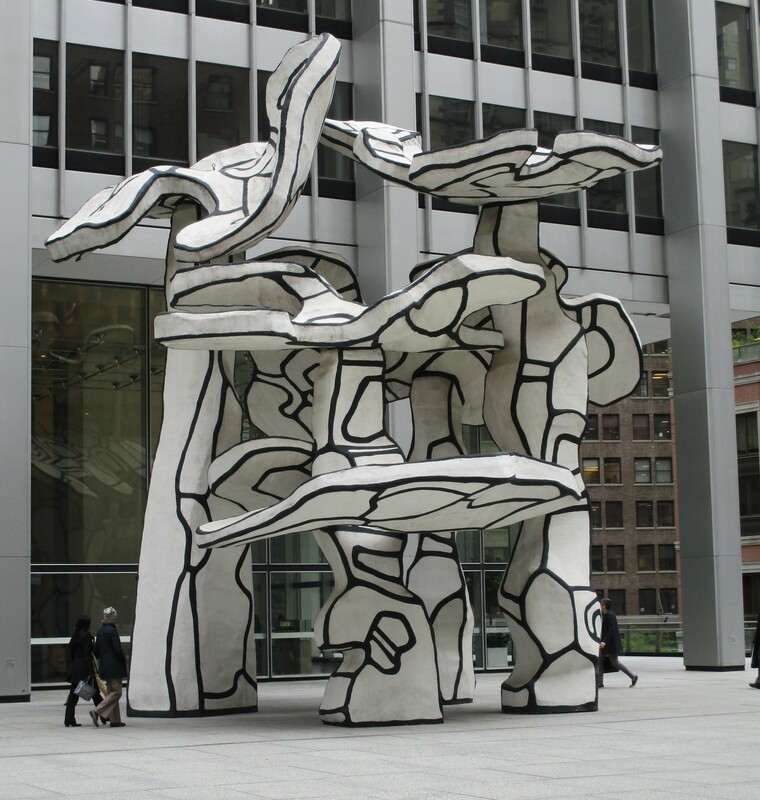 In 1969, David Rockefeller, then chairman of Chase Manhattan Bank, asked Jean Dubuffet to design models for a possible sculpture to be placed in front of the bank’s new building. Already, the building’s plaza included Isamu Noguchi’s Sunken Garden, completed in 1964, and the bank’s leaders wanted to add another sculpture as well. 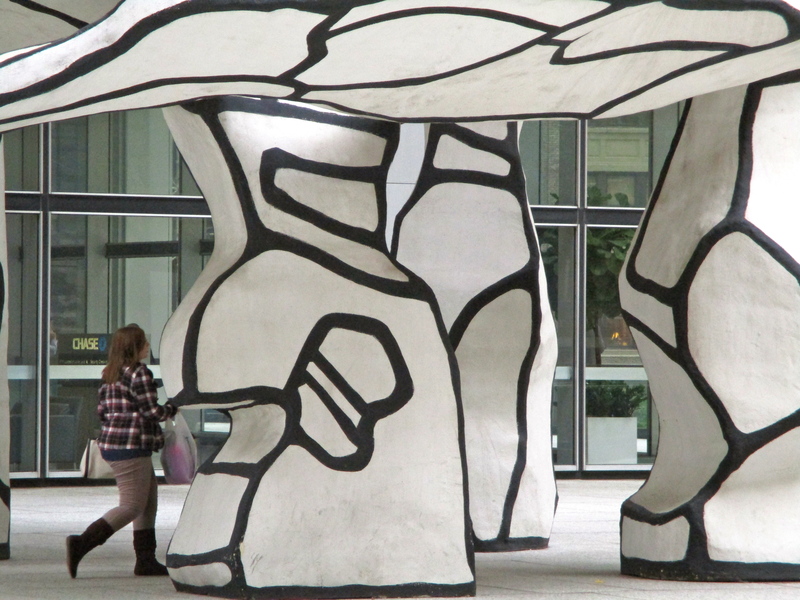 Dubuffet submitted a number of models, of which Group of Four Trees was chosen. He then enlarged the piece for placement in the plaza. 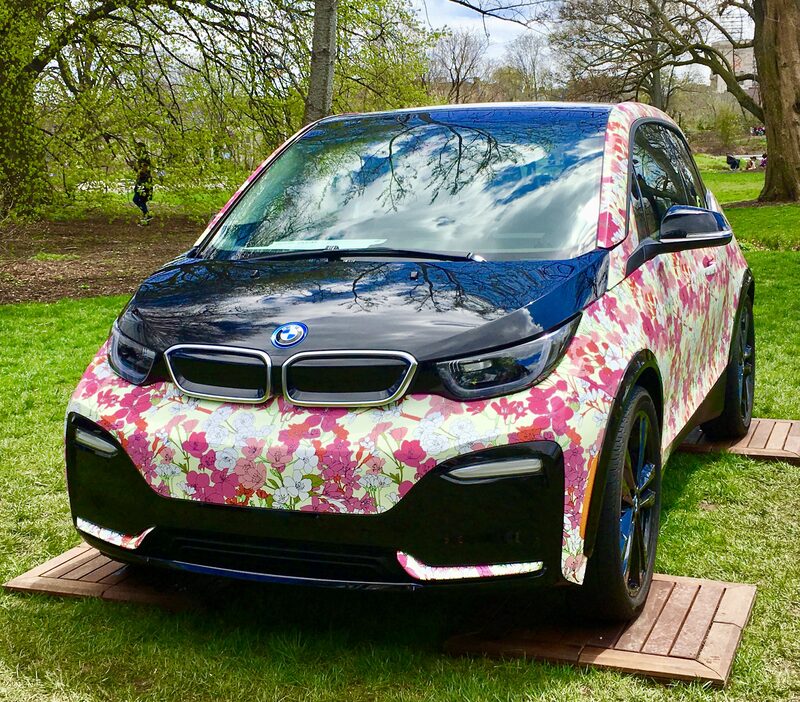 The sculpture is made of synthetic plastic over an aluminum frame, with a steel armature holding the whole piece together. Group of Four Trees is located in the Chase Manhattan Bank Plaza, off Pine Street, between Nassau and William Streets, in NYC’s Financial District.